Hello, We R friends! 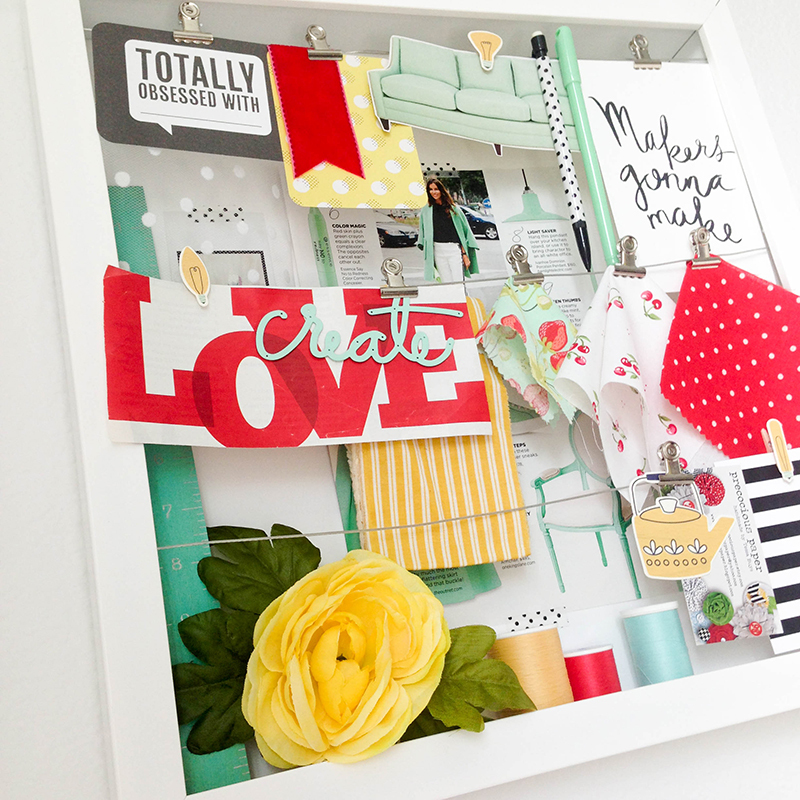 Shellye McDaniel here today with a fun take on organizing with the awesome new Storage Frame and the “Honey, I’m Home” Collection! 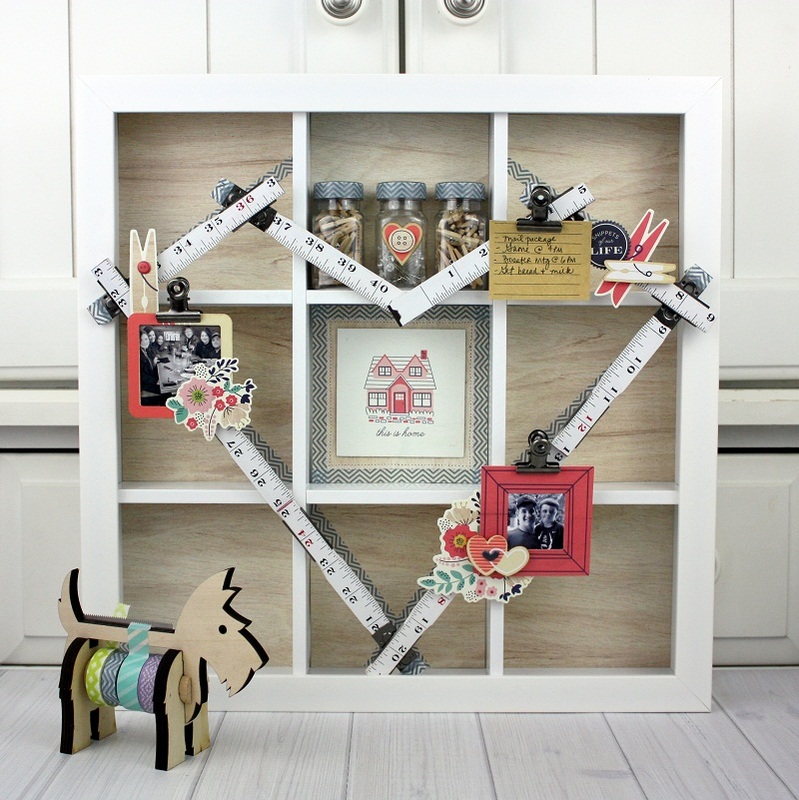 The adorable new Scottie Dog Washi Tape Dispenser was also a highlight of this project. The slate blue chevron worked perfectly with the dark blue hue in the collection. Nine squares of woodgrain patterned paper were cut to 4 7/8” and then set aside. 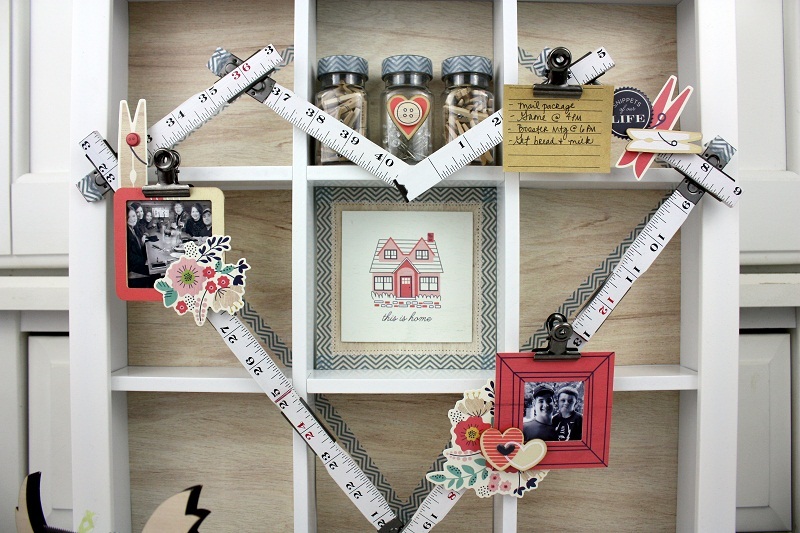 The 6” White Ruler was shaped into a heart and attached to the outside of the frame with high tack adhesive dots. 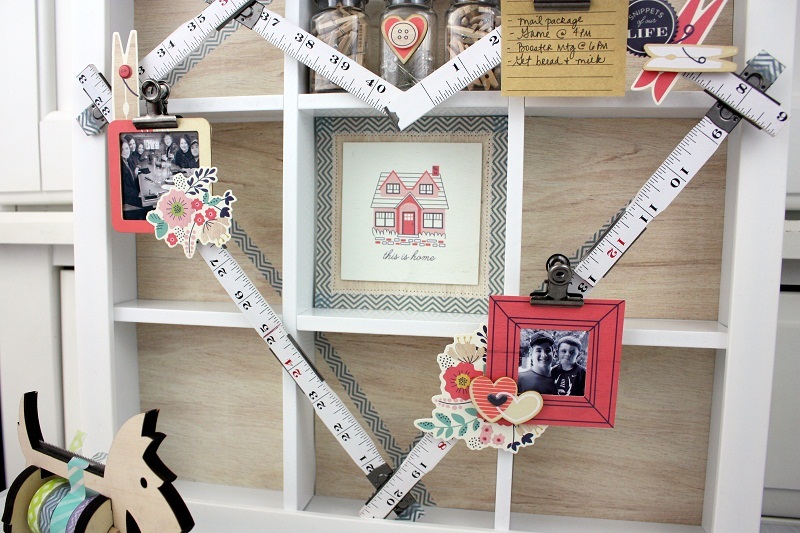 Washi tape was attached to various pieces of the woodgrain panels so that the tape would follow the outline of the ruler. The woodgrain panels were the adhered inside of the 5” squares of the frame. 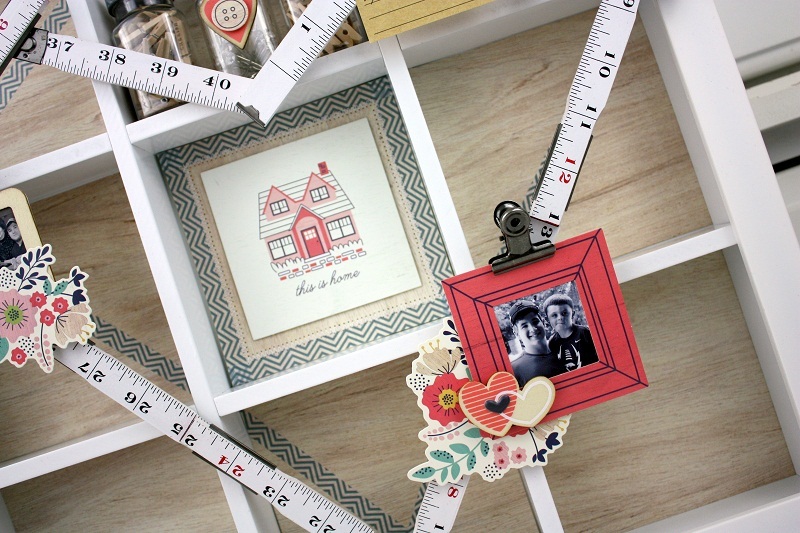 Hanging Clips, bits of die-cuts, puffy stickers and veneer pieces from the “Honey I’m Home” collection were added in fun clusters around the ruler. Small photos were added to frame pieces from the collection. 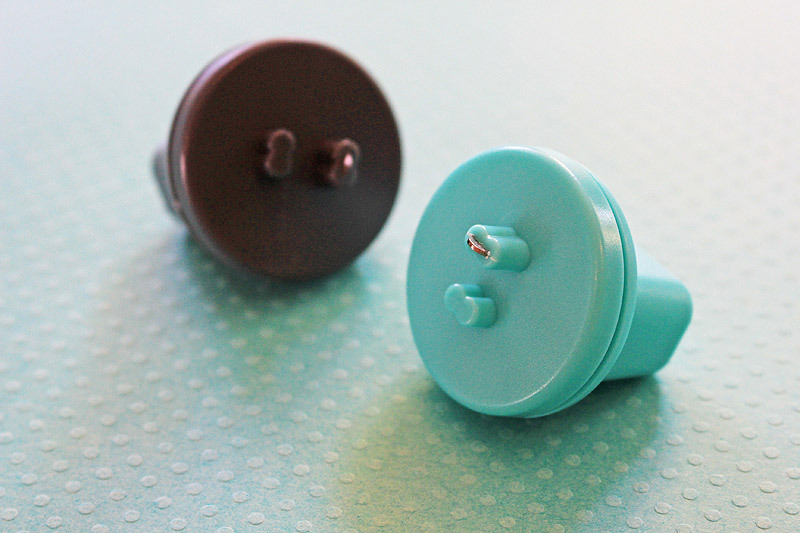 Use the Foam Adhesive Dots to secure the different pieces together. 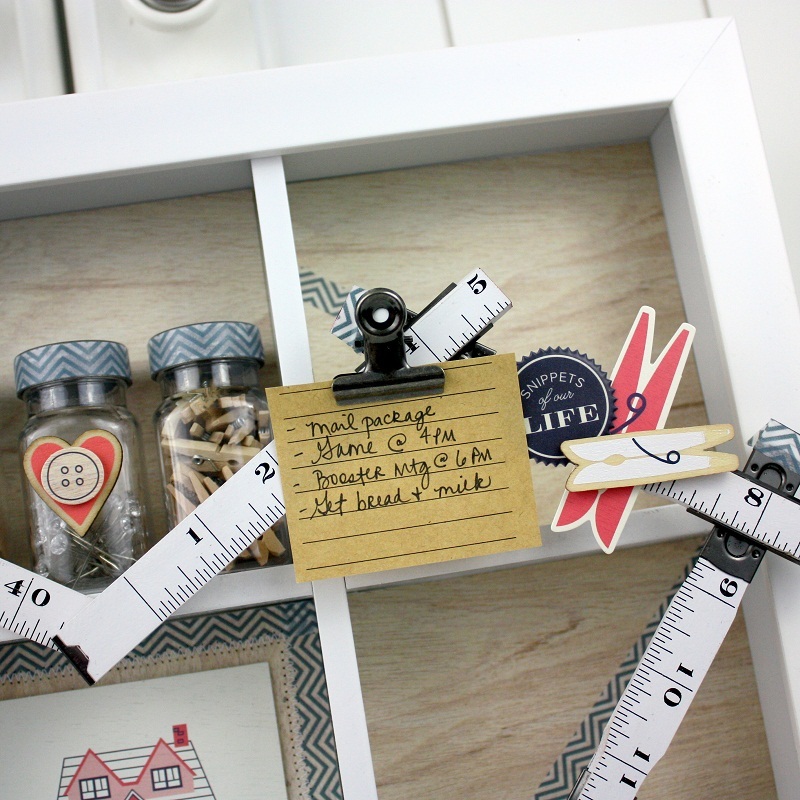 The jars that come with the Storage Organizer were embellished around the lid with the same chevron washi tape and filled with natural embellishments. To add even more detail and to carry the chevron design to the ruler, small pieces of the tape were wrapped around several of the ends of the ruler. 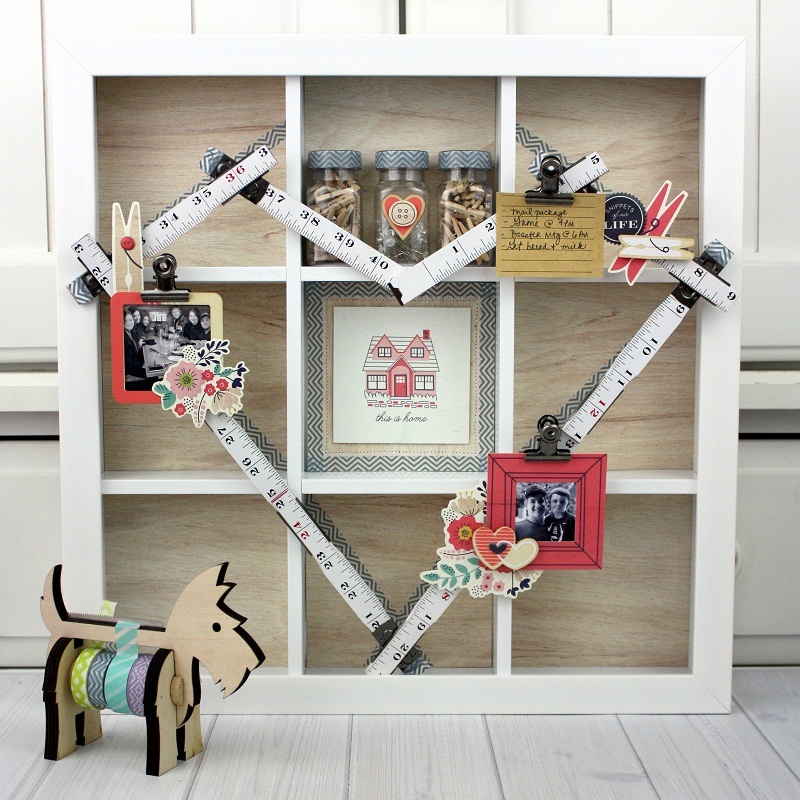 The frame is sturdy enough to stand alone on a shelf or table or it can be hung by the handy hardware that has been included on the back! Today on the blog we’ve got design team members Chantalle McDaniel and Shellye McDaniel sharing some tips for craft room storage and organization. They’ll show us how they store their favorite We R Memory Keepers supplies. 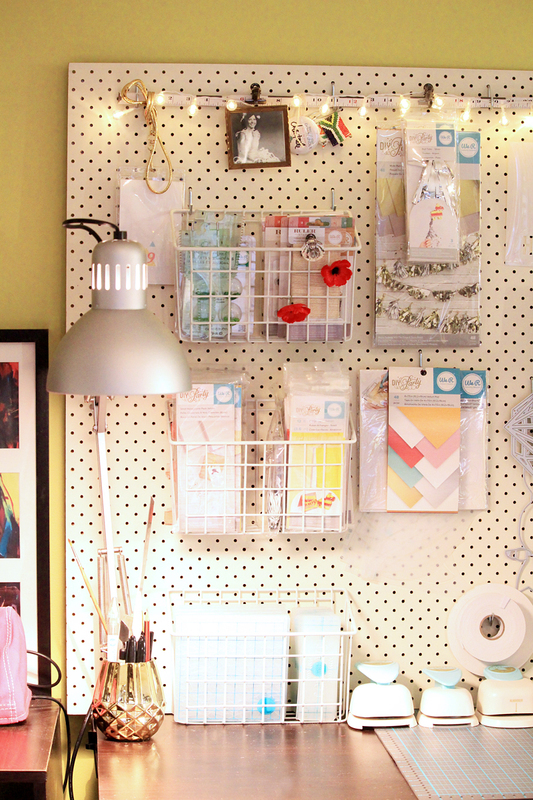 First off is Chantalle with a darling pegboard that’s as stylish as it is functional. Hello We R fans! I’d love to share my little craft space with you today. As you can see, I have a snippet in the corner of our lounge/dining room. Floor space is at a premium, so I chose to go up rather than out! 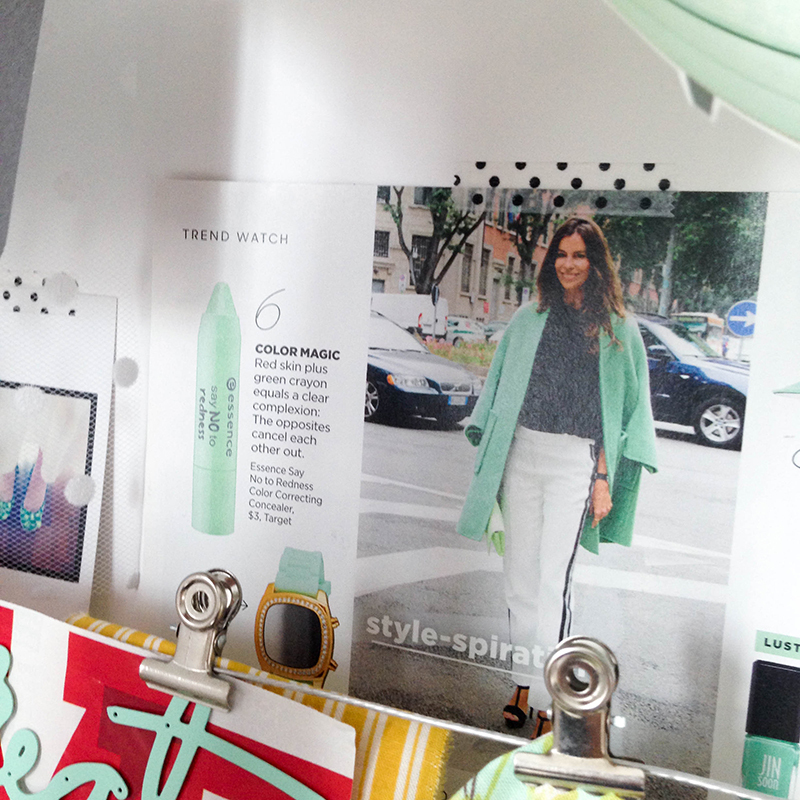 I’m sure you will agree, pegboard is not only fashionable, but seriously functional. I love being able to see exactly what options I have to create with and feel completely inspired when I sit at my desk. The thing I love most about using the board is that I can rearrange things when the need arises. Different types of hooks on their own or with little baskets etc, allow me to store a variety of tools and product – even my 123 Punch Board! It doubles as a tray to hold my cute Washi dispenser pals. My Fuse tool, along with Fuseables and accessories are stored nearby in my Fuse Storage box. Saving my best feature to last… Along the top of my board, I have run a white 6 inch folded ruler from the Ruler Studio collection. 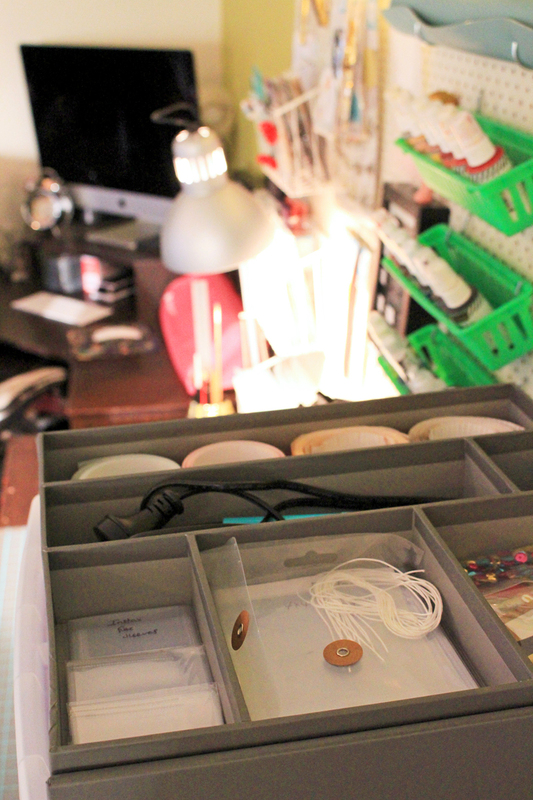 To this, I have attached some Ruler Studio metal hooks and a strand of Ruler Studio bulb lights. (These are battery operated, and completely portable.) 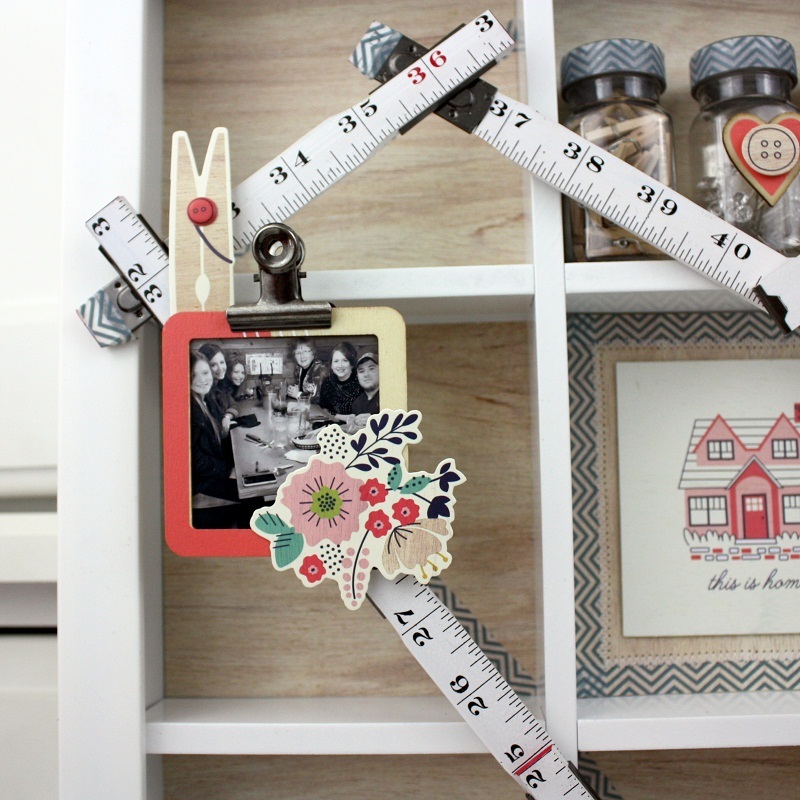 The hooks can be used to hang anything from product to photo frames! I love the soft glow the lights give off at night. Best of all they are customisable with gorgeous covers, which have already started shipping to retailers, so keep an eye out for them at your favourite WRMK supplier. Hello! Shellye McDaniel here. 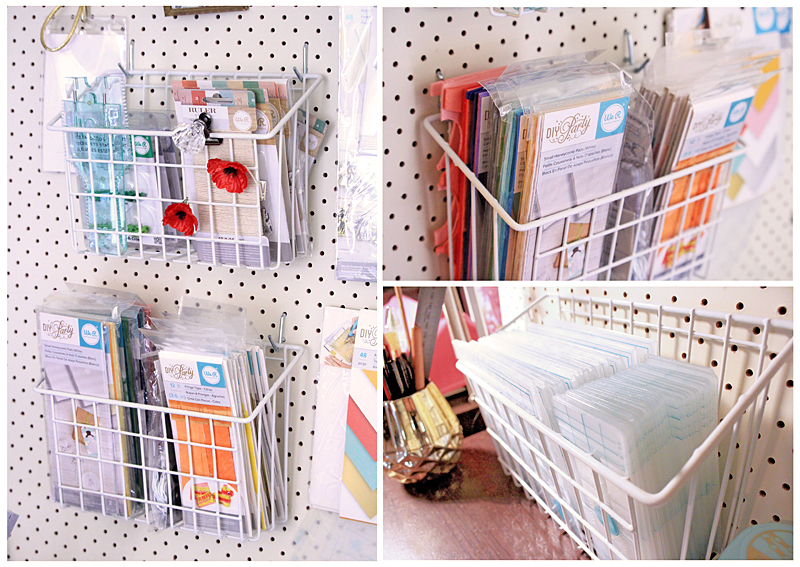 Like many crafters, I keep a lot of my supplies and tools in baskets and bins, but I do have a couple of extra spots for organizing my things! 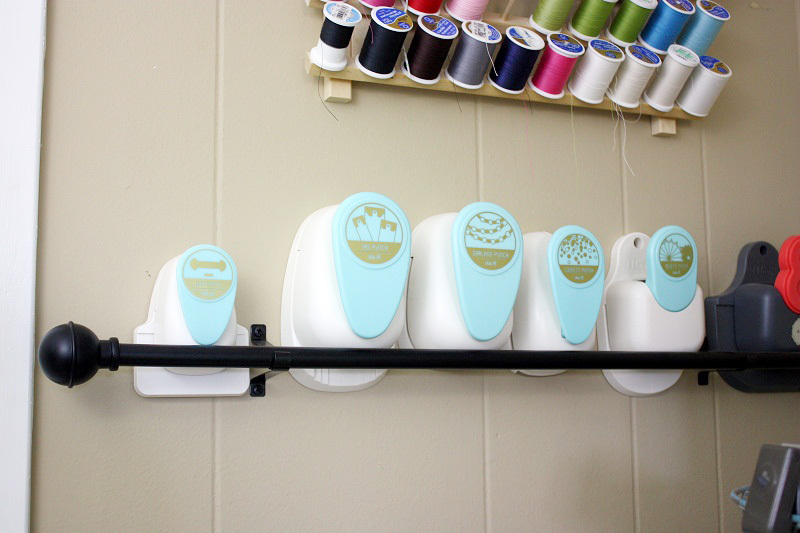 I purchased a few of these very inexpensive curtain rods at the dollar store and hung them horizontally behind a door in my craft room; it’s the perfect spot and I hate to waste any space when it comes to storage! The various WeR Memory Keepers punches sit nicely and better yet, they are in full display so I can see and grab them easily. Next, I like to keep packaging for certain tools, especially when they have detailed instructions or even a sample of how a finished project is supposed to look. 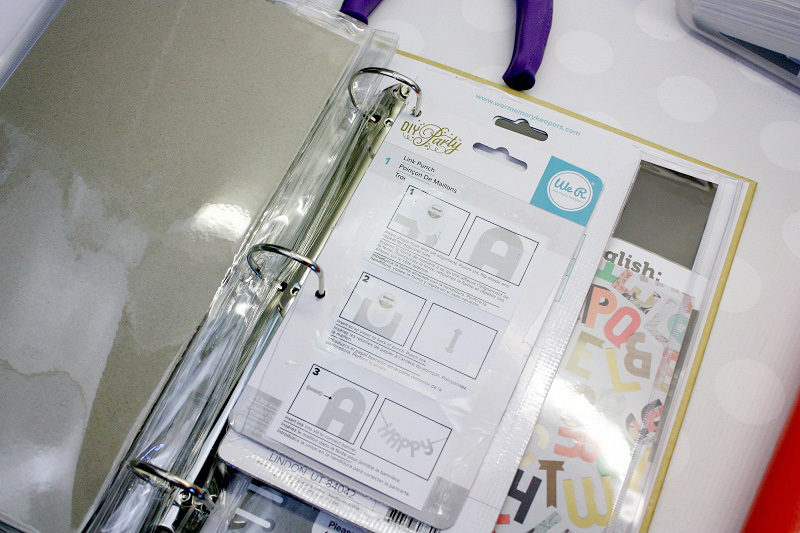 I punched holes (with my Crop-A-Dile) into cardboard packaging and inserted them into the binder along with the dies! 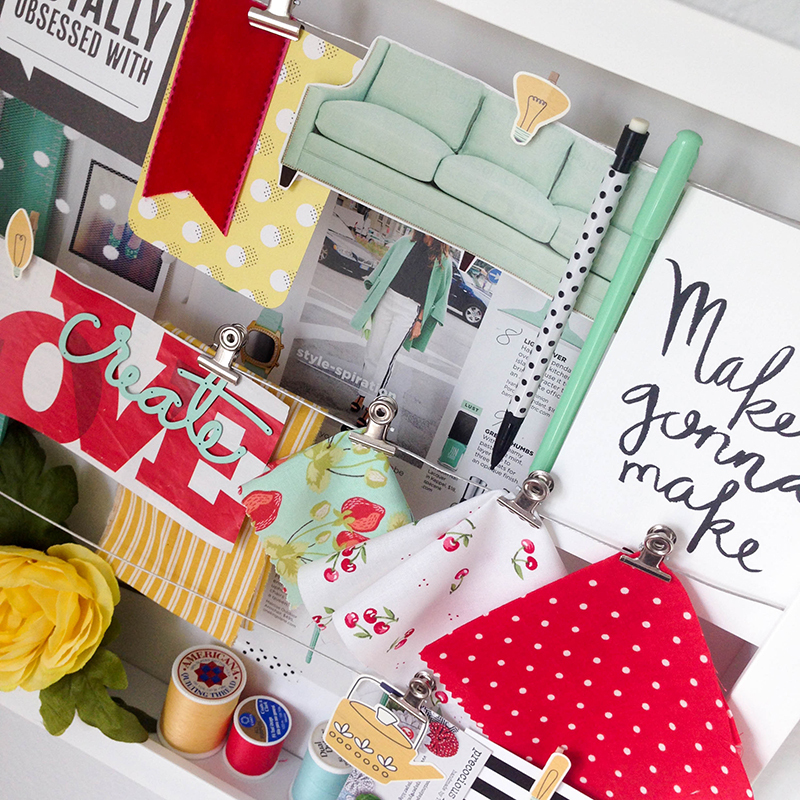 We hope you’ve enjoyed these craft room storage and organization tips from Chantalle and Shellye. Be sure to come back tomorrow for more storage ideas! Hello, friends! 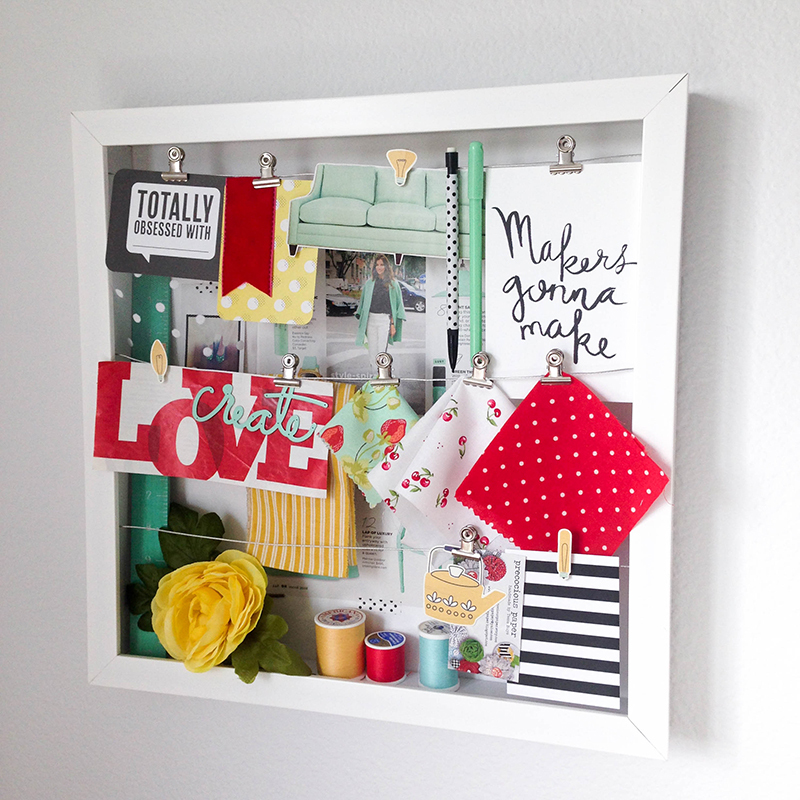 Tessa Buys here with the latest addition to my craft room: The We R Memory Keepers Organization Gallery Clip Frame. I am in the process of redecorating and reorganizing my craft room, so I decided to gather magazine clippings, fabric swatches, and other bits and pieces to inspire the choices I’m making. 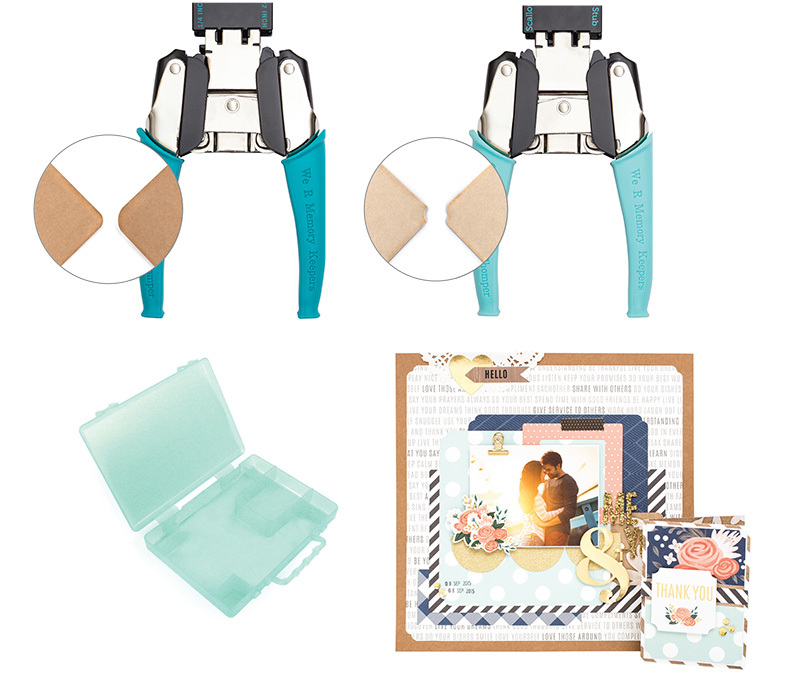 A big change I am making is moving from aqua to mint in my color palette, so I started by attaching a page from a magazine all about the color mint to the back of my clip frame with washi tape. I love that the frame is so deep! This allowed me to treat the bottom of the frame like a shelf to add objects that couldn’t be clipped to the wires, like the silk flower, a ruler, and spools of thread. 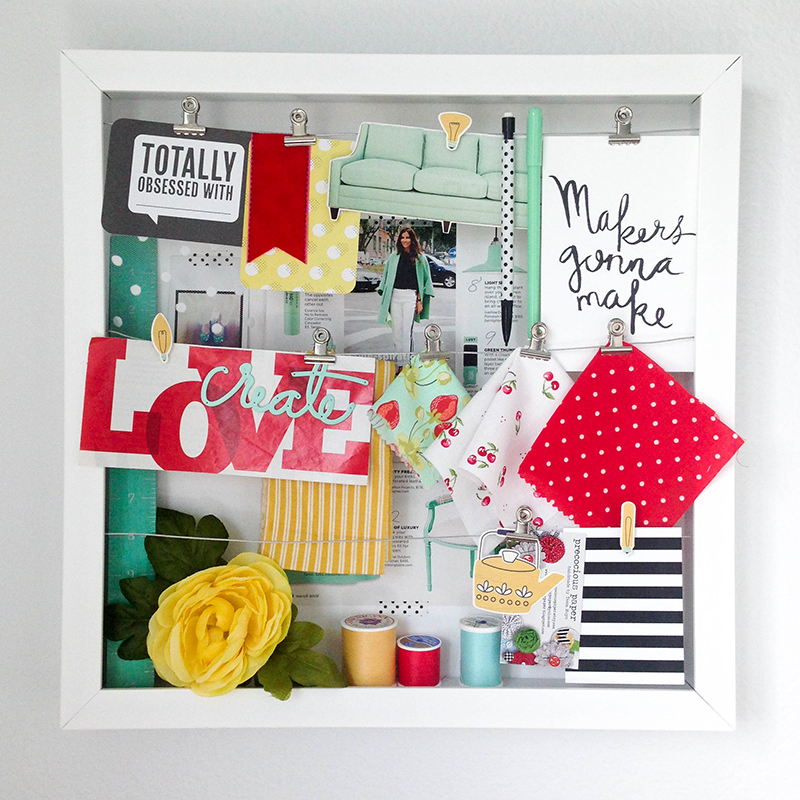 The Clip Frame comes with clips, but I added so many things to my inspiration board that I needed more! I took a few light bulb die cuts from We R Memory Keeper’s Honey I’m Home collection and glued them to mini clothespins. 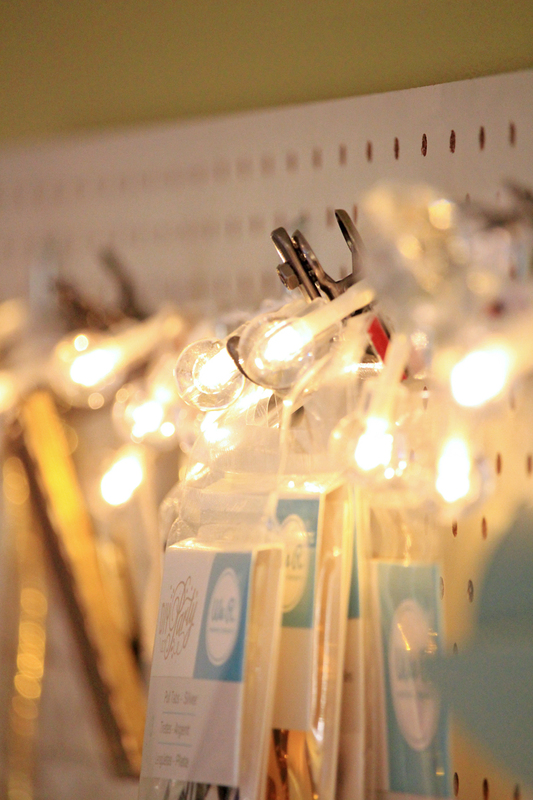 Talk about a bright idea, right?! I love the way this looks on my wall and I can’t wait to add more Organization Gallery Pieces to the mix. You’ll love them all, too! Thanks for visiting the blog today and have a wonderful day! Happy Monday friends! We’re thrilled to bring you yet another set of wonderful new releases today. 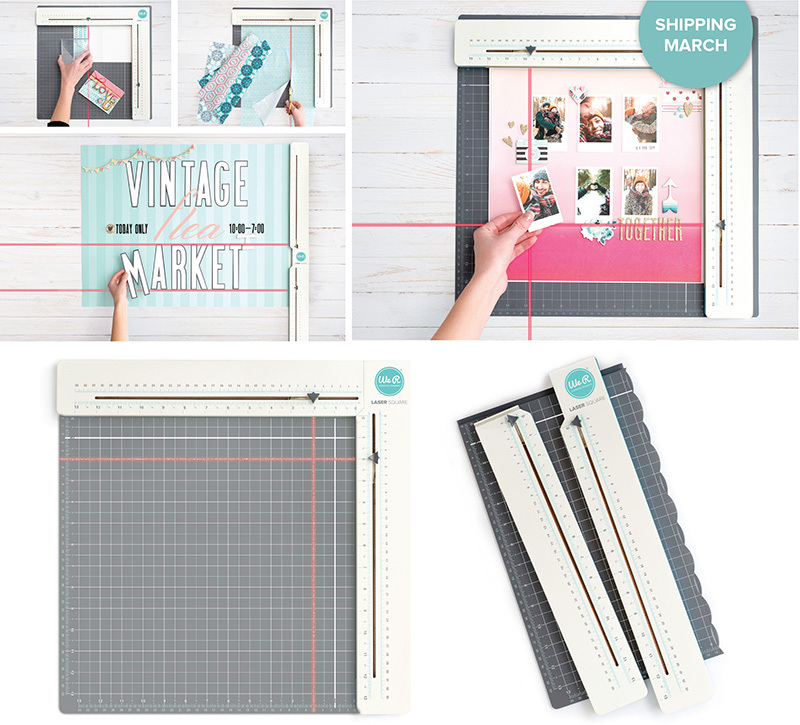 These tools are designed to make your crafting easier and your projects look more beautiful. They just started shipping to retailers today, so watch for them in stores and online in the next few weeks. Quickly align, straighten, and perfect any project with the new Laser Square. 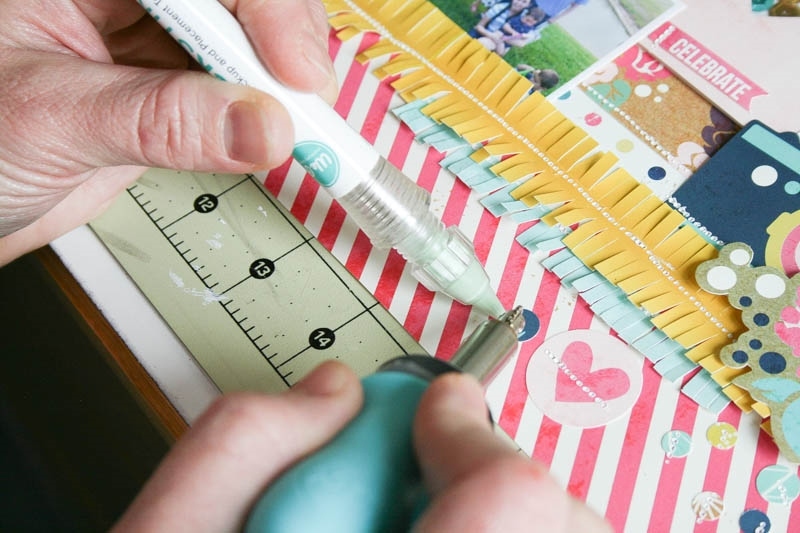 This tool is perfect for scrapbooking, stamping, quilting, school projects and more. It includes inch and metric measurements, and the laser slides from 0 to 12 in (0 to 30.5 cm). The mat and Laser Square fold down for convenient storage. The Laser Square can be adjusted to a 90° angle or placed together in a straight line. 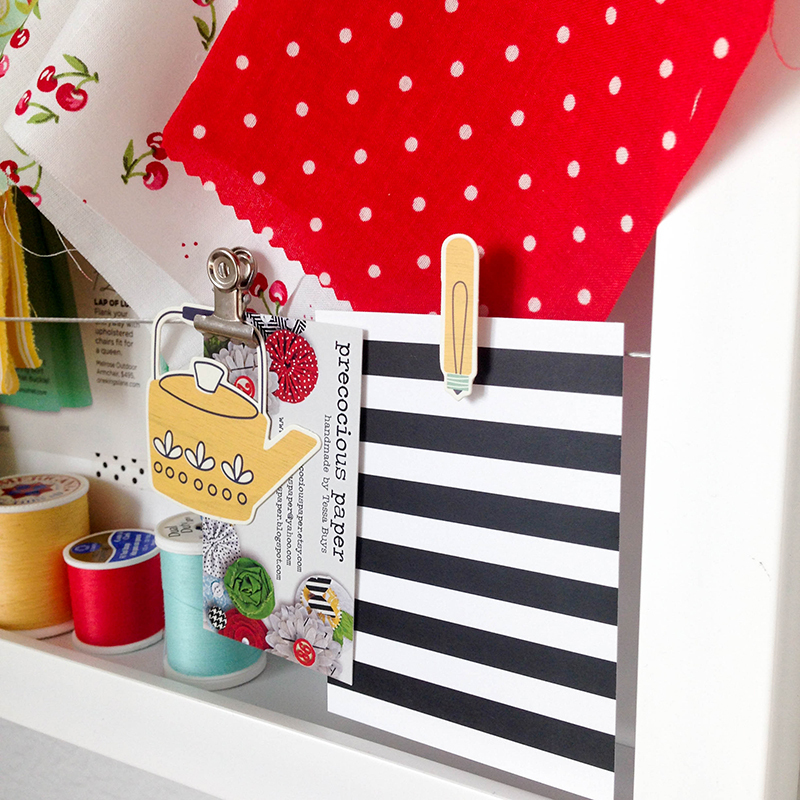 Embellish your corners with the Corner Chomper! Each Corner Chomper has 2 designs. 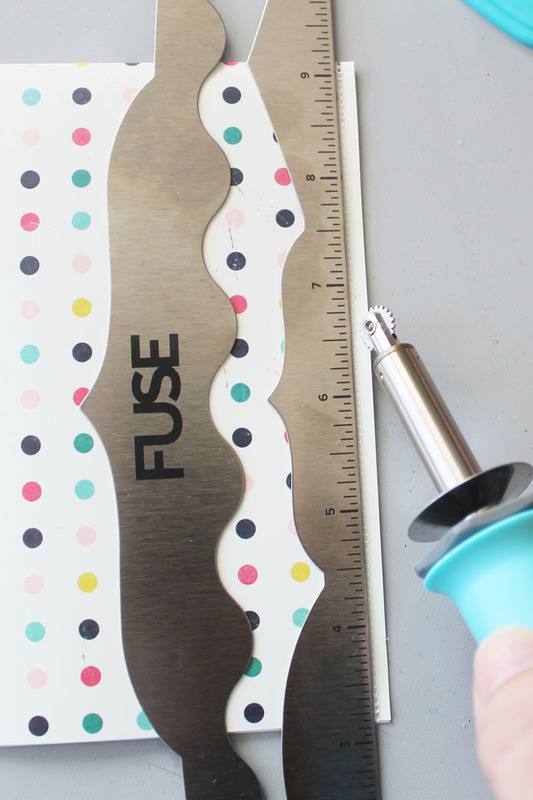 Use these sturdy tools to cut through paper, cardstock, chipboard, leather, plastic and more. They both have a scrap storage space than you can easily open and empty when full. Multi-lingual instruction sheet included. We’d love to know what you think of these new release! How would you use them in your crafting? Leave a comment below and tell us all about it. Easter is such a special time of the year. For me, it’s a time of reflection and the hope of new beginnings. My family especially looks forward to a lovingly prepared meal around the table. I don’t go crazy with the décor, but I do enjoy putting together a themed table setting for holidays and special events. This year, I will be adding some bright notes with fresh whites. I love how the candy colours bounce off the neutral tones! 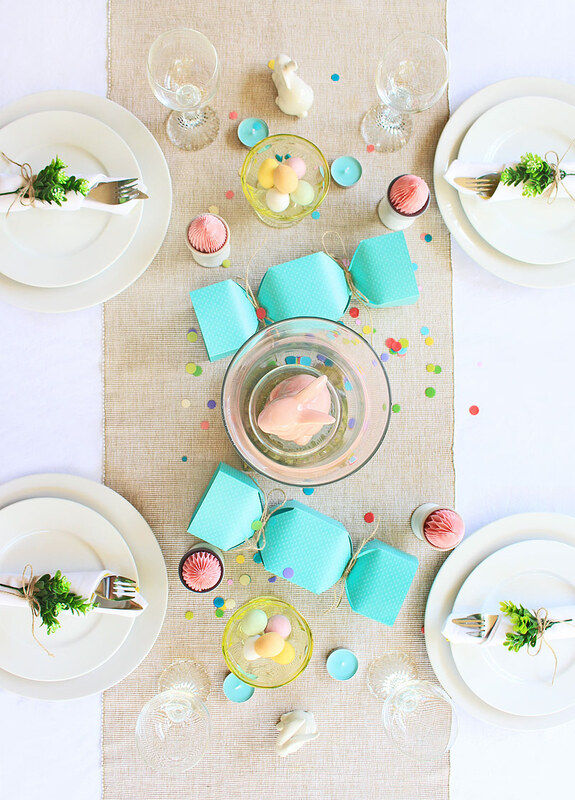 It’s no secret that I am just a little smitten with DIY Party Honeycomb Pads. How adorable are these little eggs! So quick and easy to make, they bring such a sense of fun and nostalgia to the table. Take your Honeycomb pad and you will notice that it is divided into two sections. I split the sections, as I find it quite tricky to accurately cut such a dense amount of paper by hand. 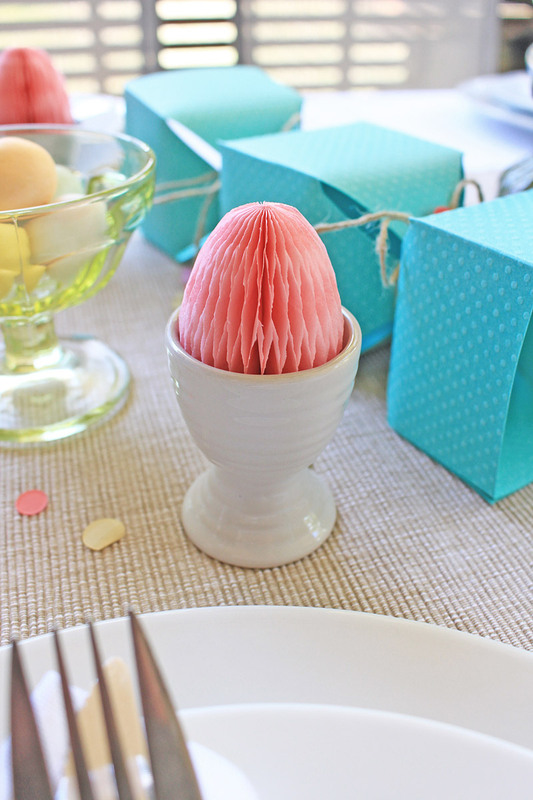 For my little eggs, I have selected the Egg shape template from the DIY Party Honeycomb Stencils pack. Choosing the smallest size, I then used a pencil to trace inside the guide. NOTE: I traced two identical shapes for each egg, as I wanted a nice full shape. 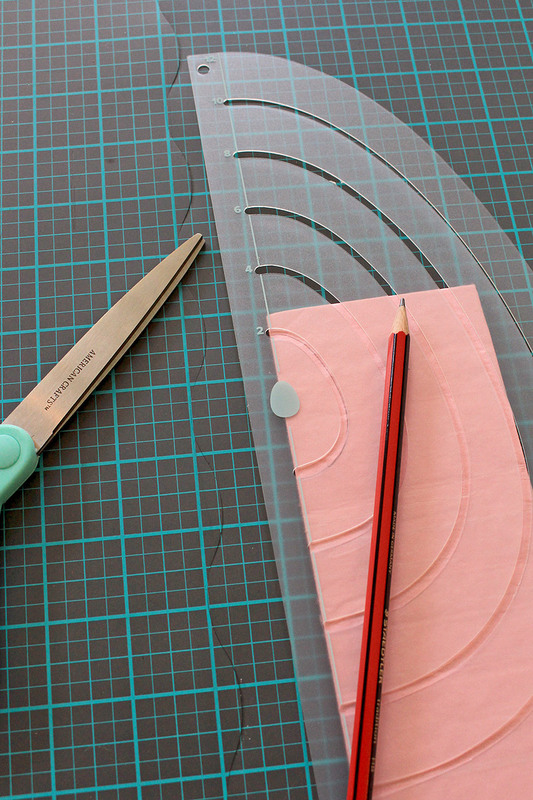 When I was done, I used scissors to cut along the pencil guide. I then adhered the two shapes together like a sandwich, opened it up like a fan and glued the ends together to secure in the dome shape. Another sweet decorative element I have added to my table are some Candy Boxes. These would make fantastic Christmas crackers too. Best of all, you could stuff them with whatever takes your fancy! Creating these in Template Studio with the Candy Box Guide was a breeze. Inside the Template Studio Starter Kit you will notice there are some guides included, as well as two types of tools. The dark grey one is the cutting blade and the aqua one is a scoring tool. We will be using both, along with the guides to create the boxes. 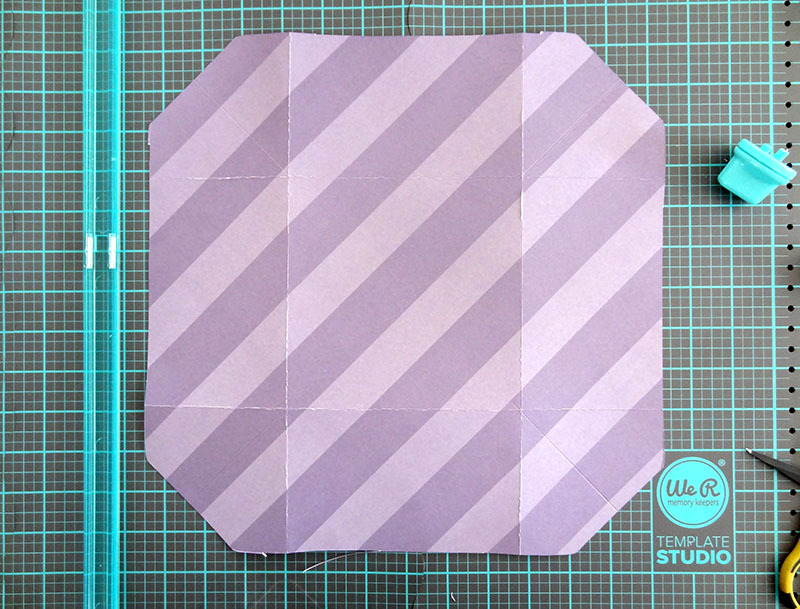 I have chosen the smallest of the sizes offered on the instructional cards for the Candy Box template. This one called for a 13.5 x 11.5 inch sheet of paper. 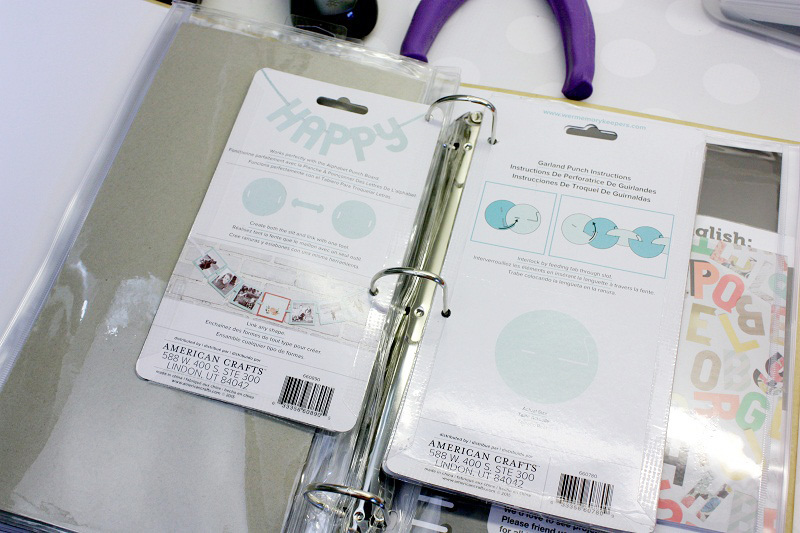 (The straight guides in the starter kit can be used to cut down large sheets of paper.) I then placed the box guide into the allotted marker points and using the blade and scoring tools, went about as per the instructions. What you will end up with are diamond-shaped cuts with score lines. These fold up easily to create the cracker/candy box shape. Glue the ends shut and tie up the sides with some ribbon or twine. Thank you so much for joining me today. Wishing you and your families a blessed time together. 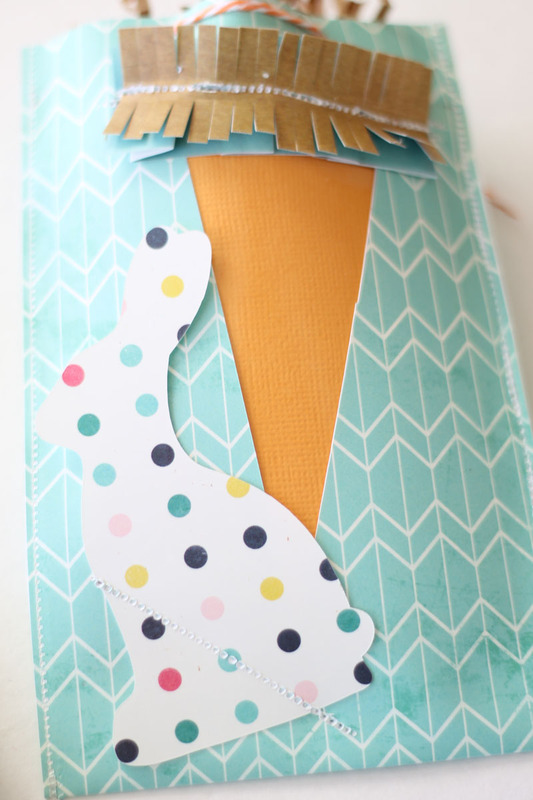 Hello, Laura here with a cute project to make for Easter using the FUSE tool and accessories. I love making little treat and goodie bags for my kids and their friends at the holidays. 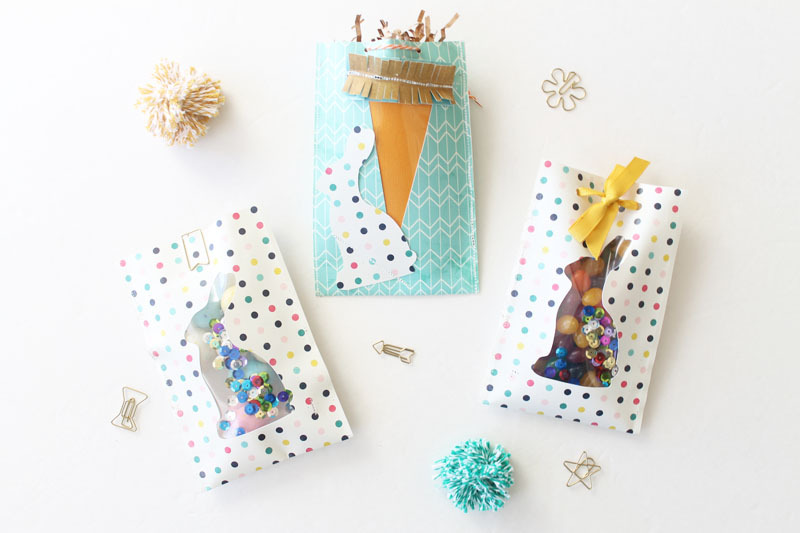 These Easter treat bags would be perfect to fill with candy, little trinkets or toys, or even small filled Easter eggs. To make these Easter treat bags, I started by cutting the FUSEables paper to 4” x 12”. 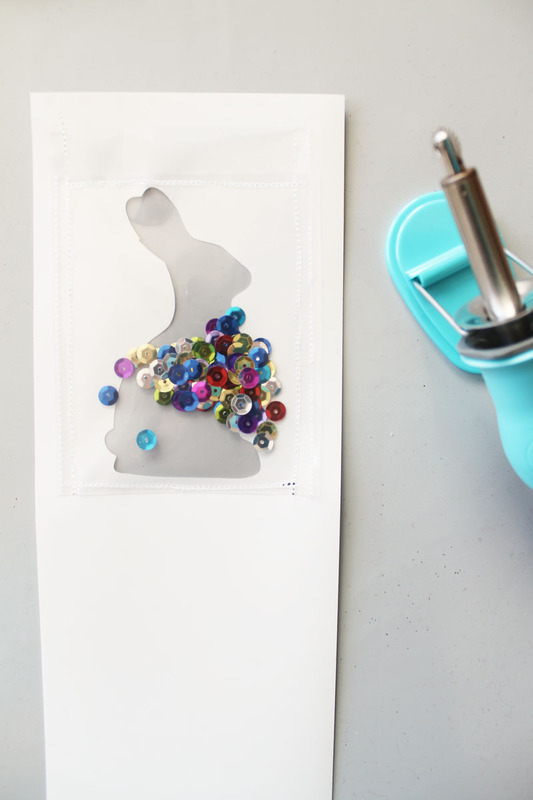 I used my electronic die-cutting machine to cut out a bunny shape on the first bag. (You could easily trace a design on the paper and cut by hand with a craft knife if you don’t have an electronic die-cutting machine.) I used a 4” x 4” photo sleeve and sealed up one side to make it a little bit smaller. I filled it with sequins and attached the pouch to the back side of my bunny design with the FUSE. To create a bag, I simply folded the paper in half and used the FUSE to close up each side. 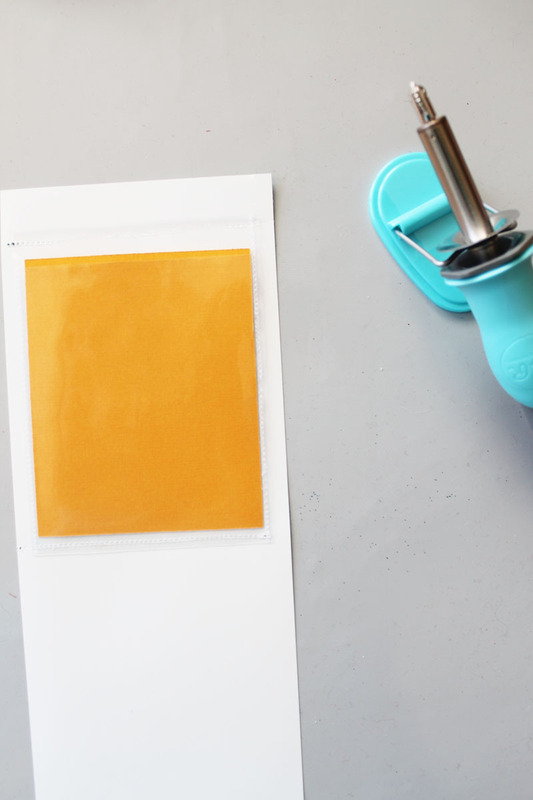 Since the FUSEables plastic paper is thicker than page protectors are, use firm pressure and go a little slower to make sure the two sides of the paper fuse together. At the top of this bag, I punched two holes and threaded ribbon through the holes. Fill the bag, tie a cute bow, and it is ready for giving. On the other bunny bag, I used a paper clip from the new Oh Goodie Collection to hold the top together. For the next bag, I followed the same process of cutting my paper and using my electronic die-cutting machine like I did for the bunny bag. This time, I made a carrot shape on the front. I again trimmed one of the photo sleeves. I added a piece of orange textured cardstock to the pocket. I fused the top and bottom of the pocket to the inside of the bag behind the carrot cut-out. To make the carrot topper, I added some of the ruffle decorate tape using my Fuse. I then added a strip of decorative tape fringe over the top. I used the bunny cut out from the first bag and attached it to the front of the pouch with the FUSE tool. 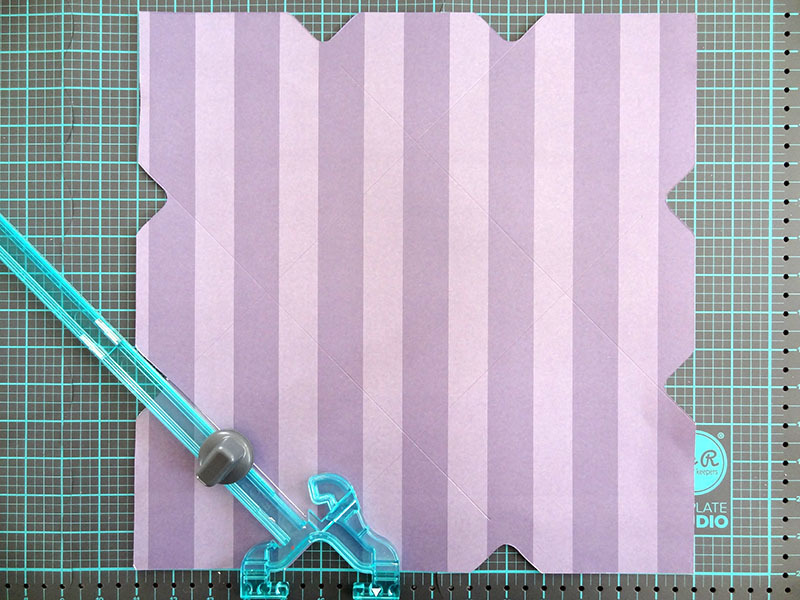 Fold the paper in half and fuse along each side to create a bag. I punched two holes in the top and added some orange twine. I love being able to see in the front of the bunny bags. 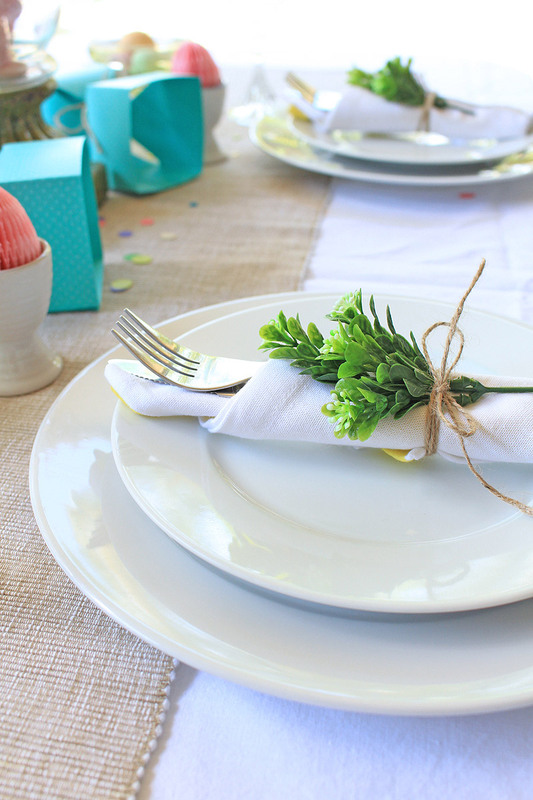 These will be the perfect little gifts for Easter. Hello there We R fans, Kimberly Crawford here with a spring mini album. I love taking photographs, but I am not always sure how to display them. 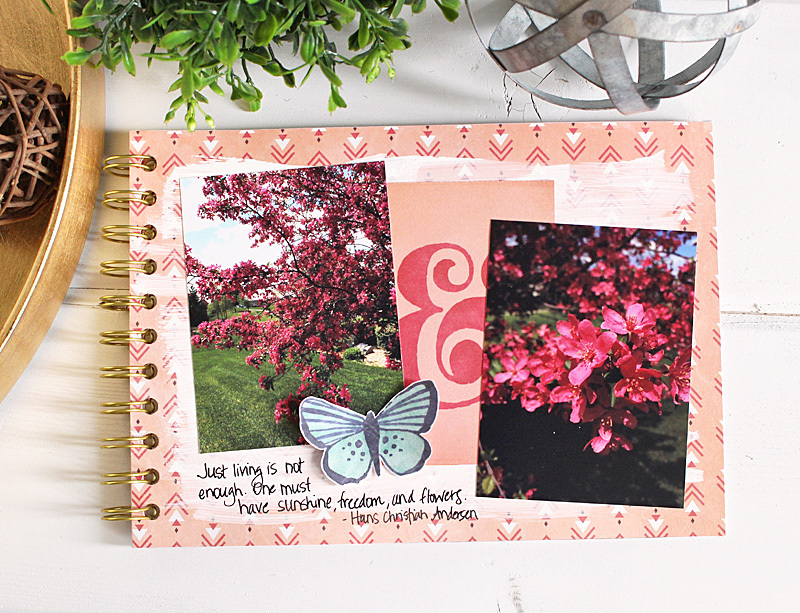 Creating this simple and elegant mini album was the perfect answer! This mini album, bound together with the Cinch will look lovely sitting on the coffee table, and my photos will now get out of a basket! For the front and back cover, I used the clear acetate sheets with gold foil. I love foil, and gold, and stripes! 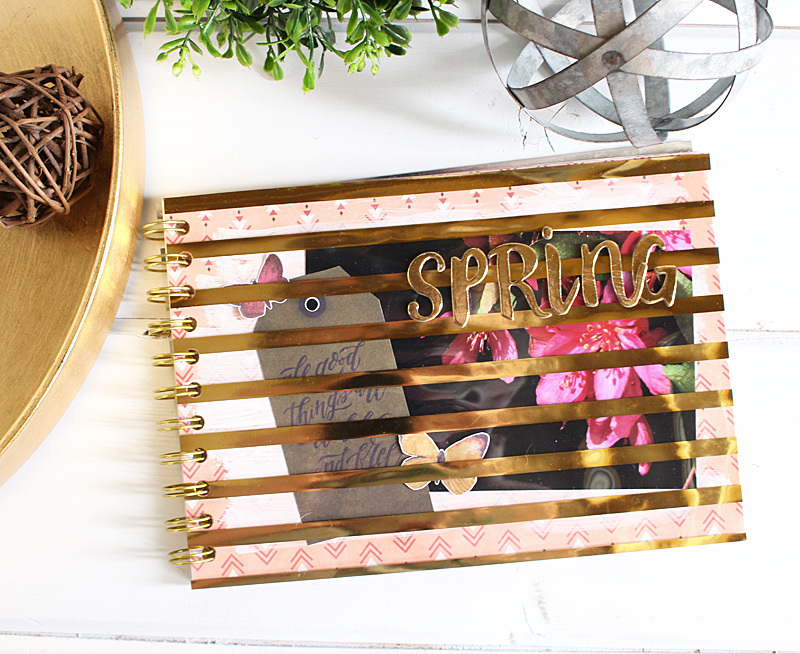 The word spring was created with chipboard stickers that were also gold foil. Then I chose papers from the Wildflower Collection. The color was perfect, but the print was distracting. To tone it down, I painted gesso on each piece of patterned paper. While the papers were drying, I went through my stash of supplies and grabbed everything that I thought would look pretty in my album. I love mixing up my supplies like that! 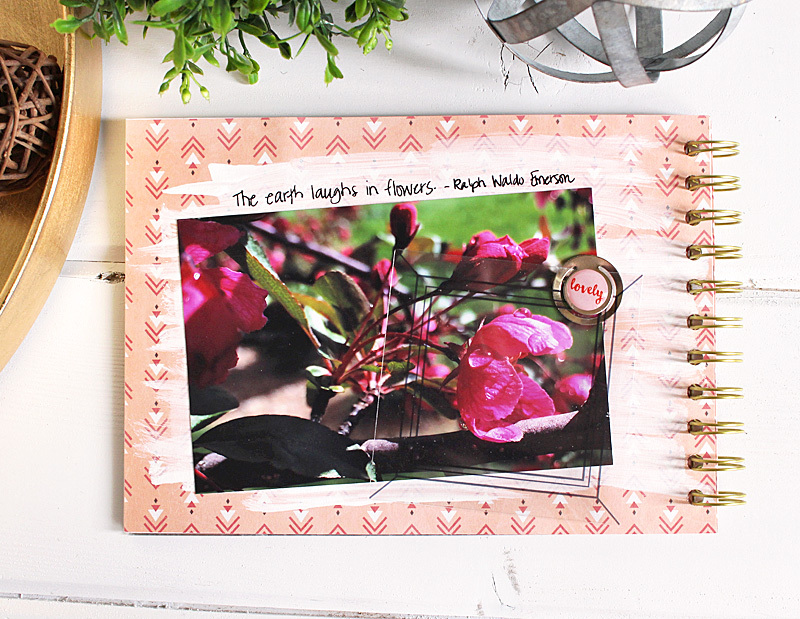 Quotes are another favorite of mine, so I added a couple of handwritten flower quotes to the pages in my mini album. To highlight the flower in this photo, I added a clear frame. To attach it to the page without the adhesive showing, I used a metal clip. While the clip holds the frame, the adhesive I added to the back of the clip holds it to the page. 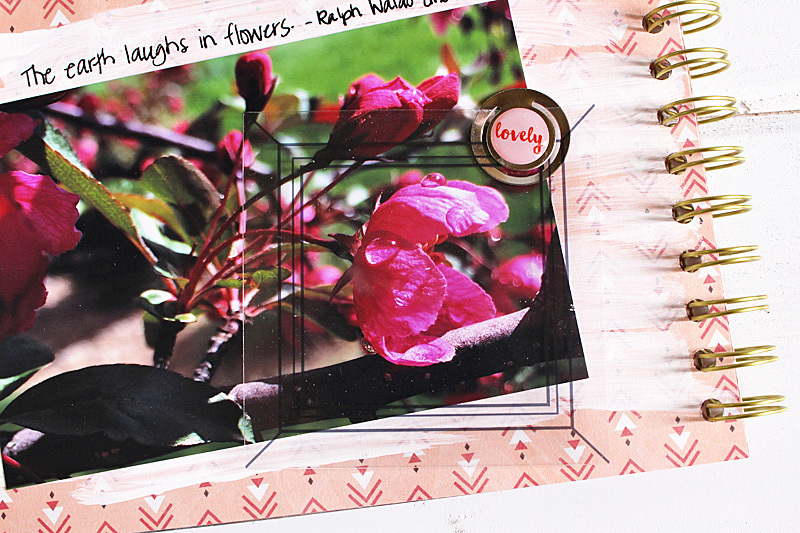 On this page I layered a journaling card behind my photos. I also added a butterfly that was cut from a piece of patterned paper. I continued using the same type of products on the last page. 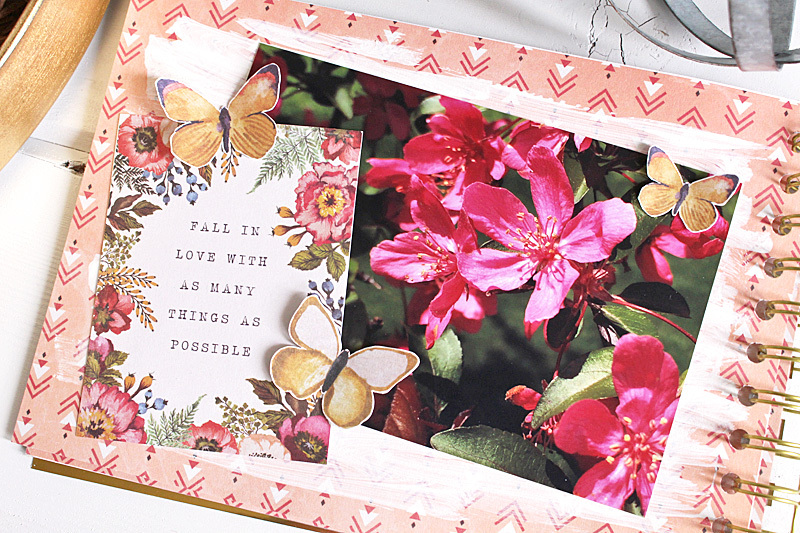 Those butterflies are the perfect embellishment! When it came time to assemble my album, the Cinch made it easy. All the pages, in their different mediums, were easily punched. I was also happy to be able to bind the pages together with gold wires. What photos do you have in hiding that need to be displayed in a mini album? Hello We R fans! Amanda here today. I think Easter baskets are so much fun. They can be made out of all kinds of different materials—wicker, fabric, plastic—to name a few. 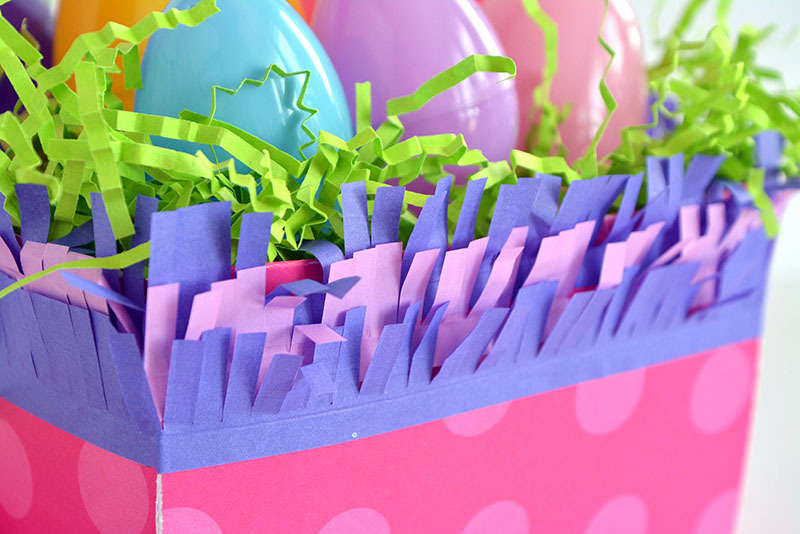 With the Template Studio, you can make a full size Easter basket out of poster board, too! 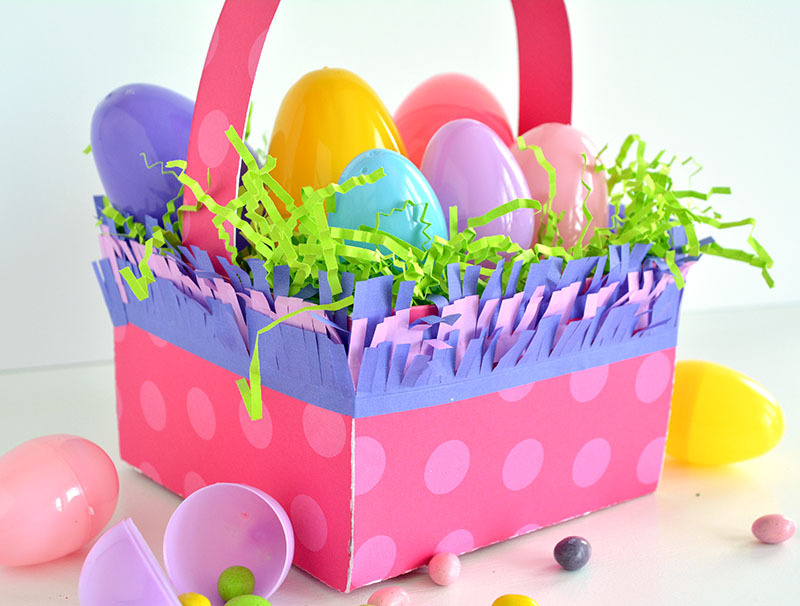 With a quick and easy modification to the Template Studio box and you can create an Easter basket that you can stuff to the brim with sweets and treats. 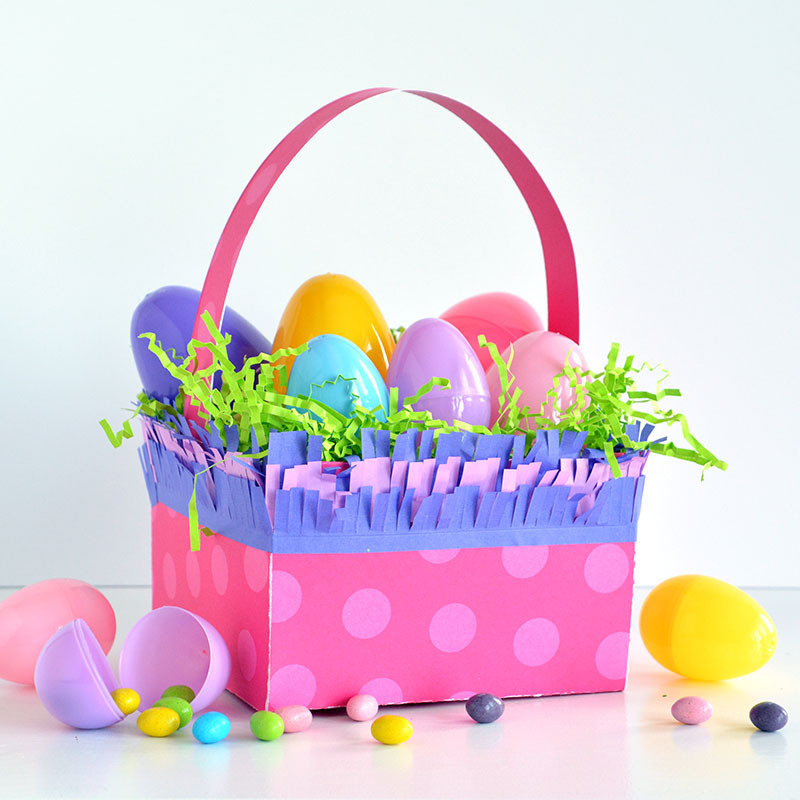 With the Template Studio, you can create Easter baskets big or…extra big! 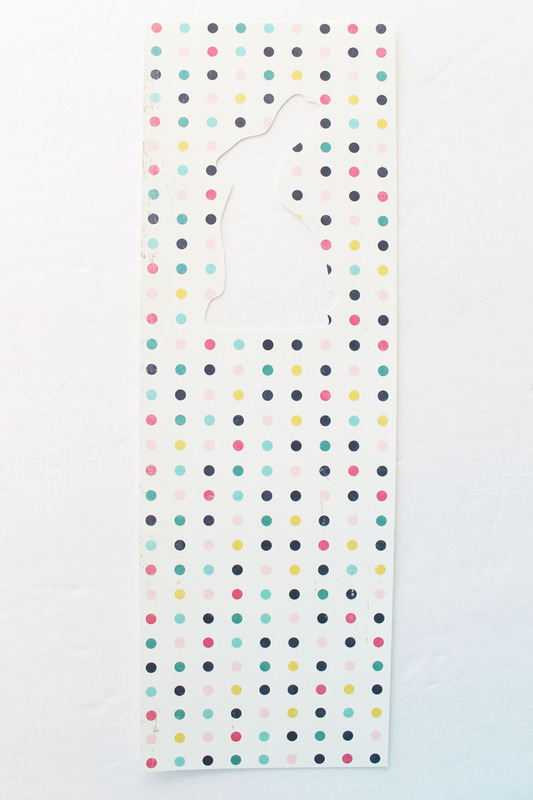 And the Designer Poster Board makes it easy to customize your Easter basket, too. 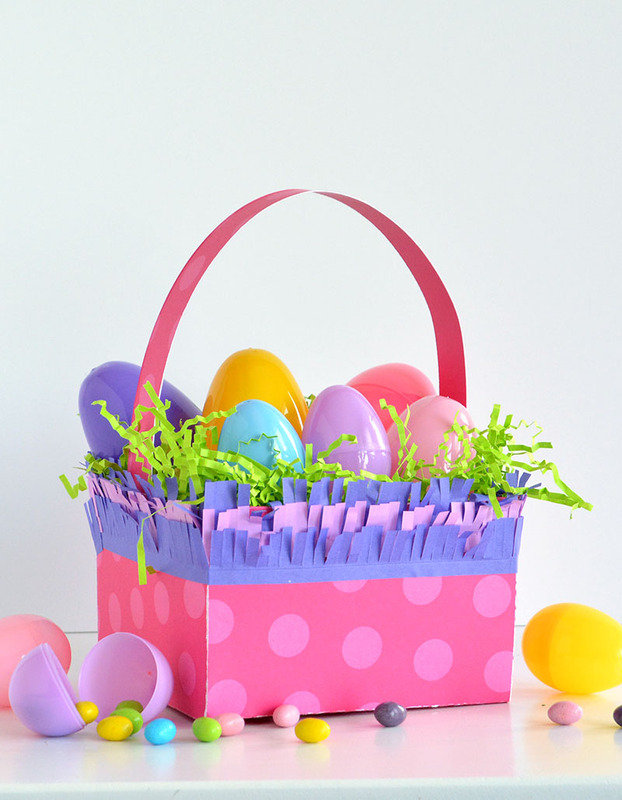 This Easter basket is about 5 ½”x5 ½”X3 ½” and fits a bunch of large and medium Easter eggs. 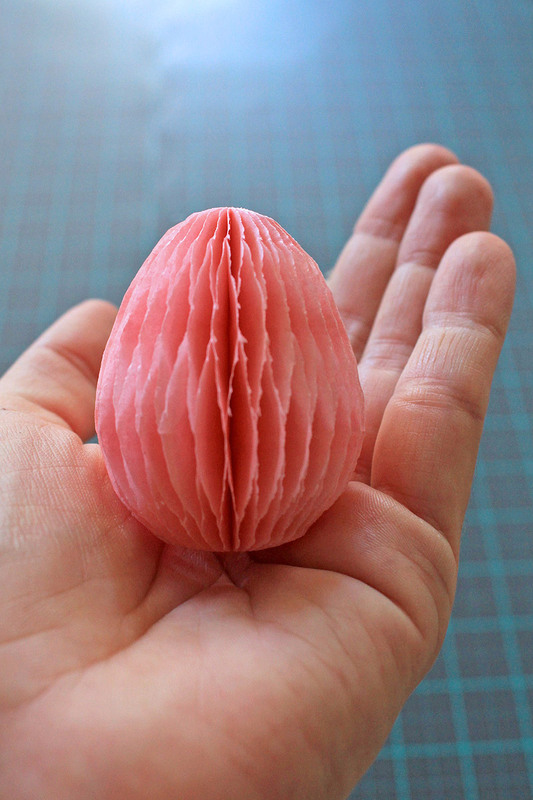 You can also stuff it with chocolate rabbits or any of your other favorite Easter treats. 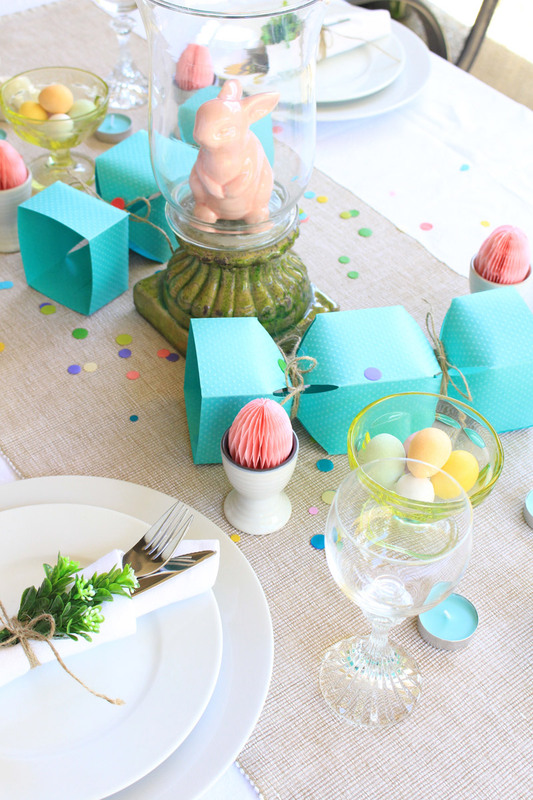 The DIY Party Fringe Tape is perfect for embellishing your Easter Basket and it comes in so many yummy jelly bean colors. Rather than using the scoring tool in Step 12 of the box making instructions, use the cutting blade to cut the flaps off the top of the box. 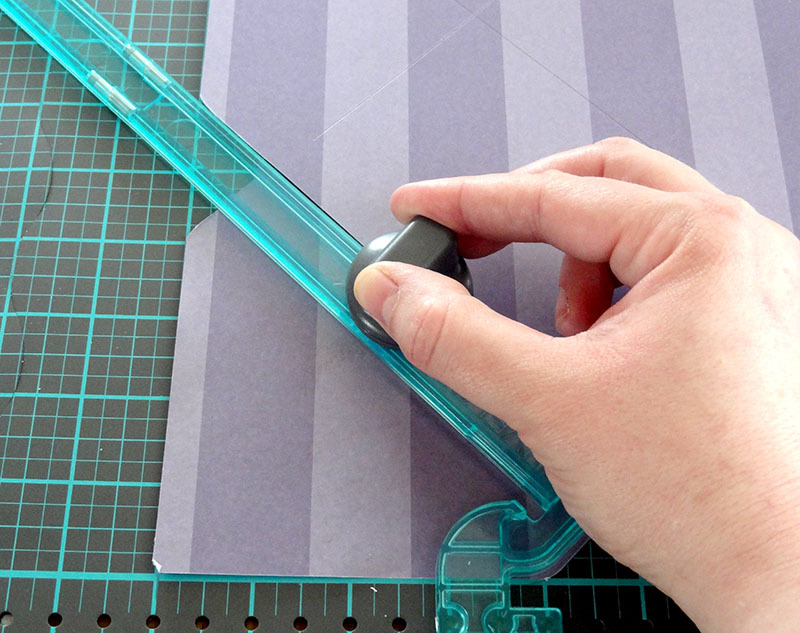 Use scissors to cut the remainder of the flap completely. This will leave you with a box with an open top. This is what your poster board will look like after you have cut the flaps off of the box. Use a tiny stapler to secure the inside flaps to the inside walls of the box. 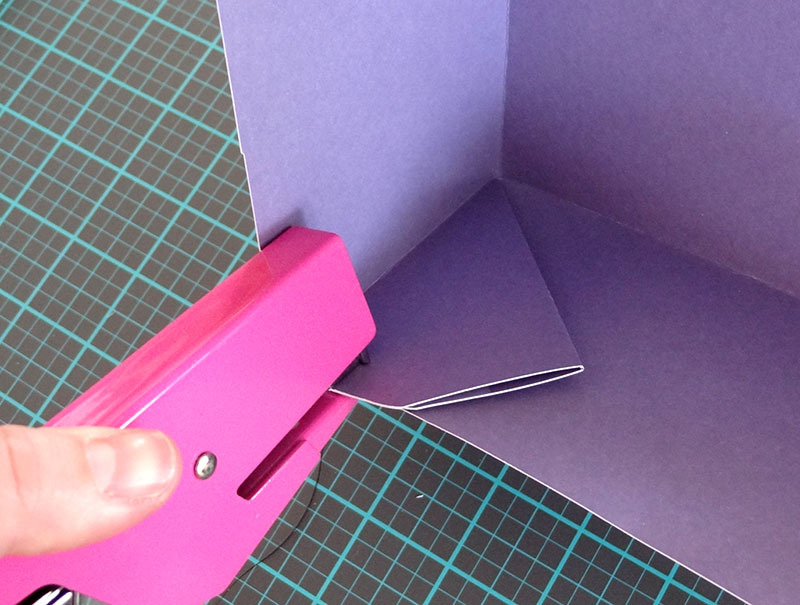 Create a handle by stapling a strip of poster board to the inside of the box. Trim your basket with fringe or other fun embellishments. Good Morning We R fans, Wendy Antenucci here today to to kick off Spring and Easter Week on the blog. 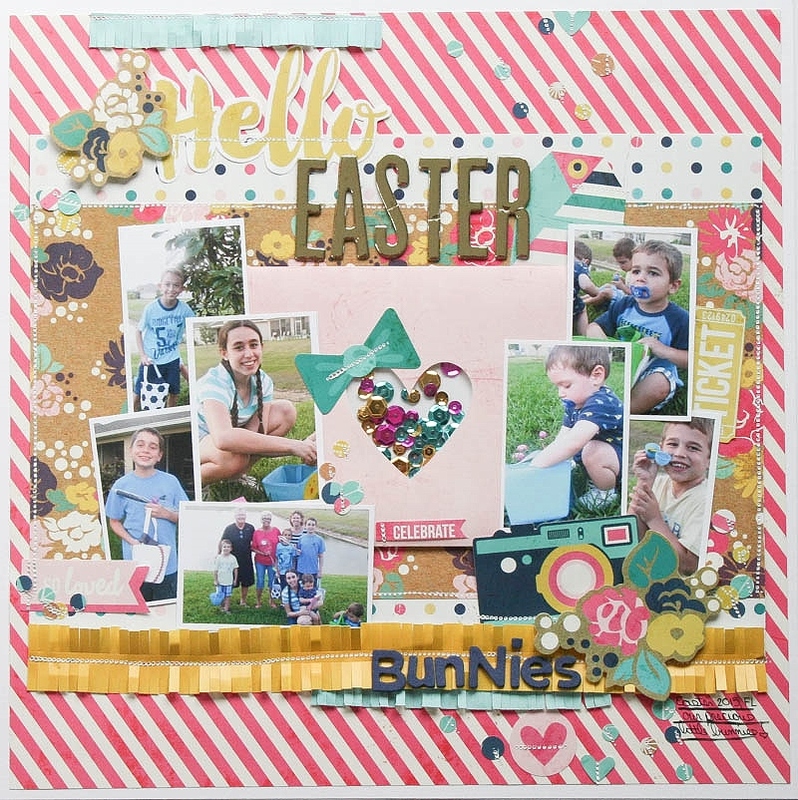 I’m sharing a fun Easter layout I created with my Fuse and Confetti Punch. We’ve all seen those pocket pages with the confetti captured in them, but I wanted to try something different. 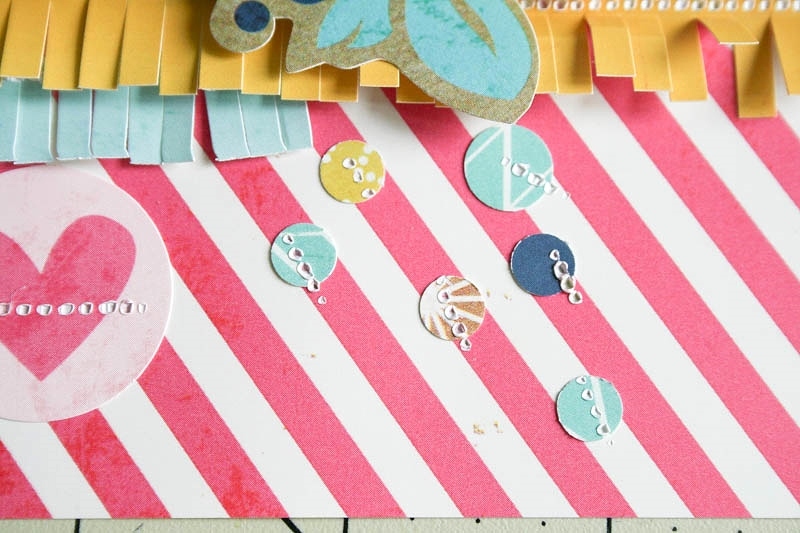 I decided to use my Fuse tool to turn my confetti into sprinkles imitating eggs on my page. 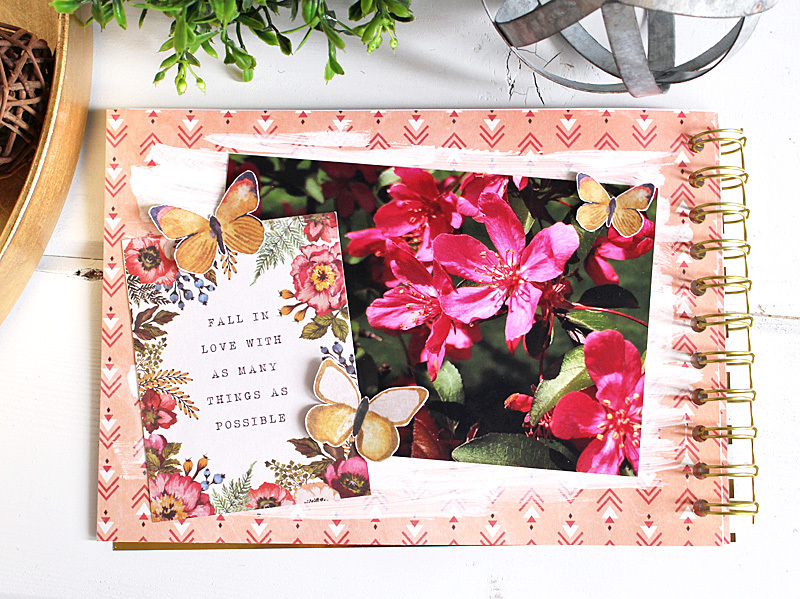 I began my page using the Embellish Card and Envelope kit in which I sealed the traditional sequins in the pocket for a fun look to group my pictures around. Using my Fuse I sealed the edges according to the directions included in the packaging. I also used this time to practice getting a straight line with my Fuse tool as I’m not the best with lines. 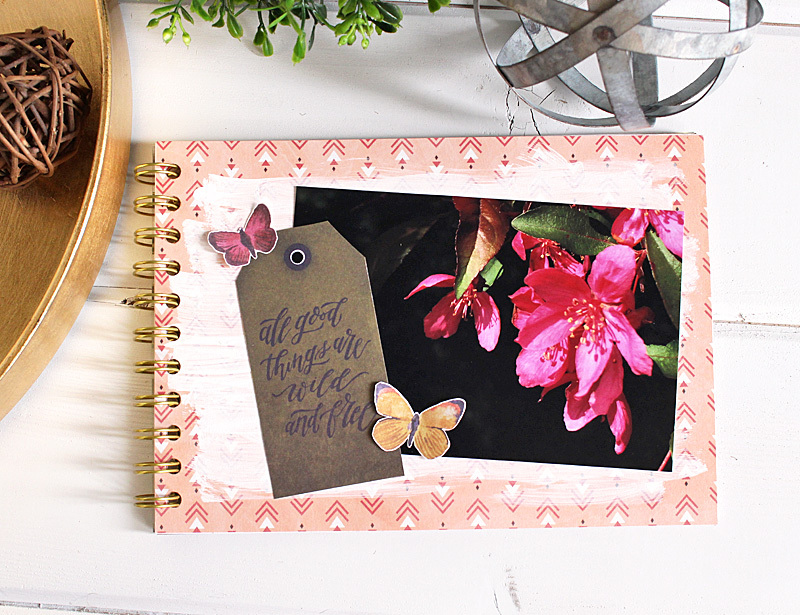 My next step after forming my “photo block” was to pick some fun background papers to create my basic layout. I then began to embellish with the FUSEable Die Cut shapes. 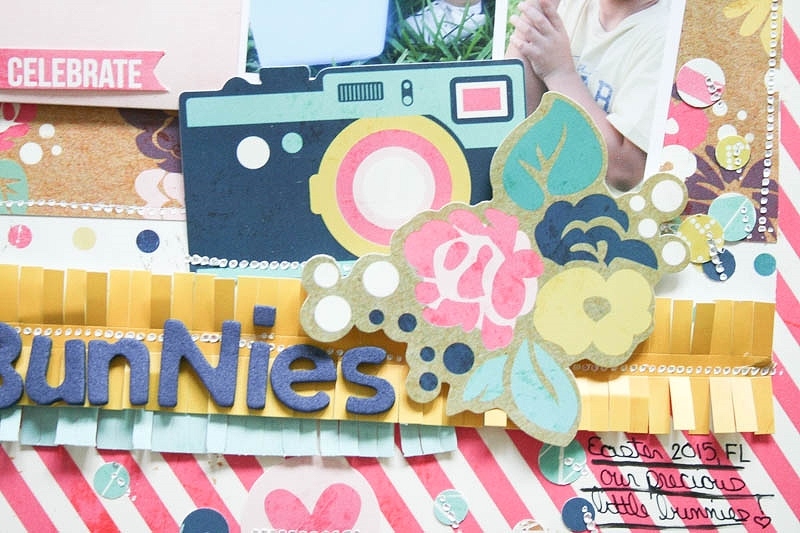 What a fun concept these FUSEables are, I loved fusing all of my items to my page and never once having to look for my tape gun! I did use foam adhesive on a few pieces which also worked great. 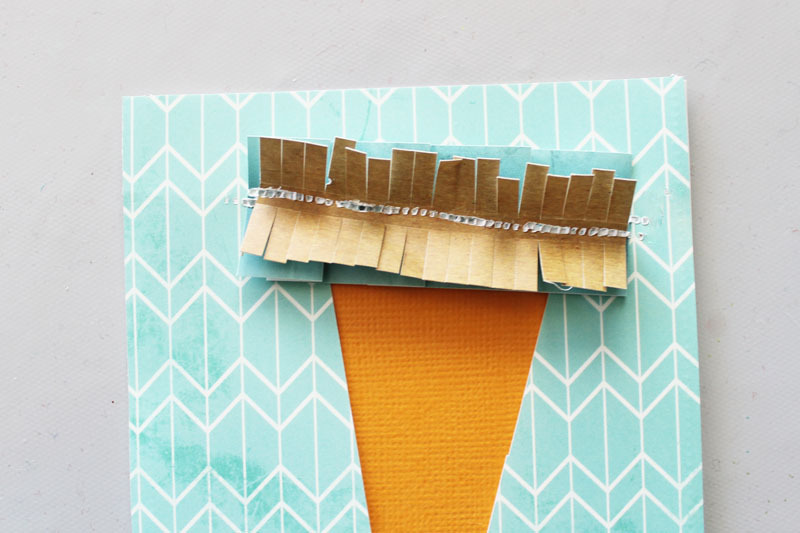 The FUSEable fringe strips are great little touches to add to your pages and projects. I cut some of the strips in half and layered others, to give a grassy effect for our Easter egg hunt pictures. 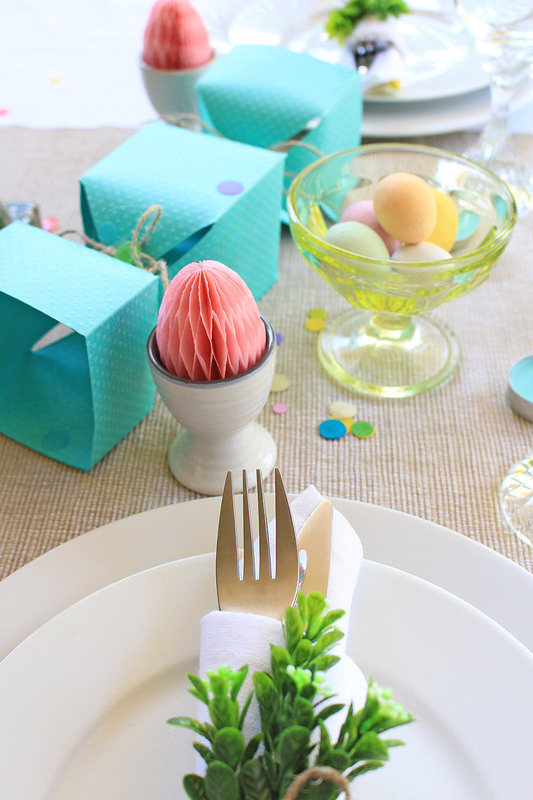 I knew I wanted to scatter confetti around my page to give the look of eggs hiding in different places. 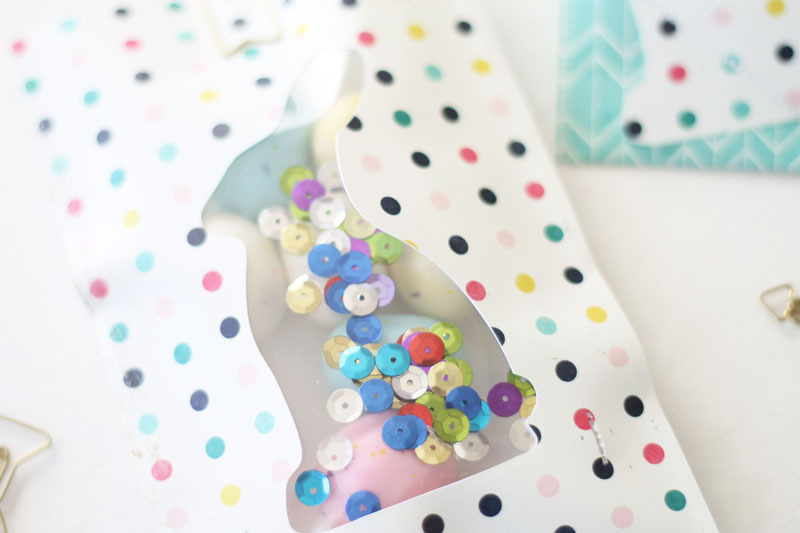 To create that look I used my Confetti punch, which punches big and small circles giving a nicely varied look. 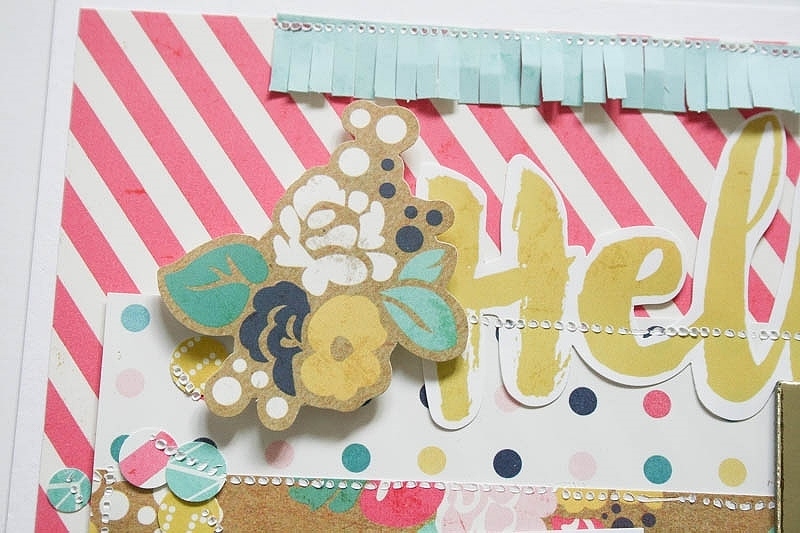 Designer Tip: To easily adhere my confetti to my page I used my QuickStik to hold the small confetti pieces and then I fused them to the page in a random pattern. 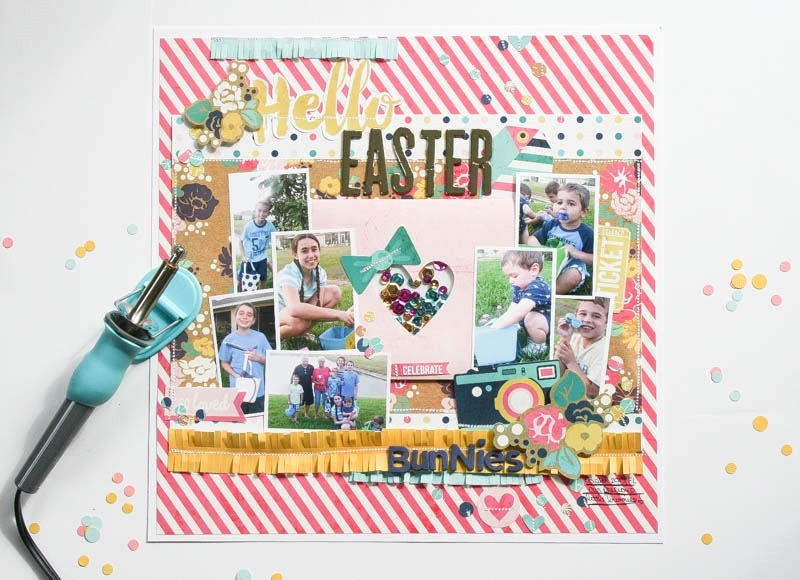 I really enjoyed playing with the FUSEable products and the Confetti punch was the perfect addition to creating a fun Easter page. What things have you Fused lately? My next attempt will be some pocket page fun! Hi everyone! I’m Carissa from SprinkledWithGlitter.com and I’m so excited to be sharing here on the WRMK blog. It’s party week and if there’s one thing I love to do, it’s party! 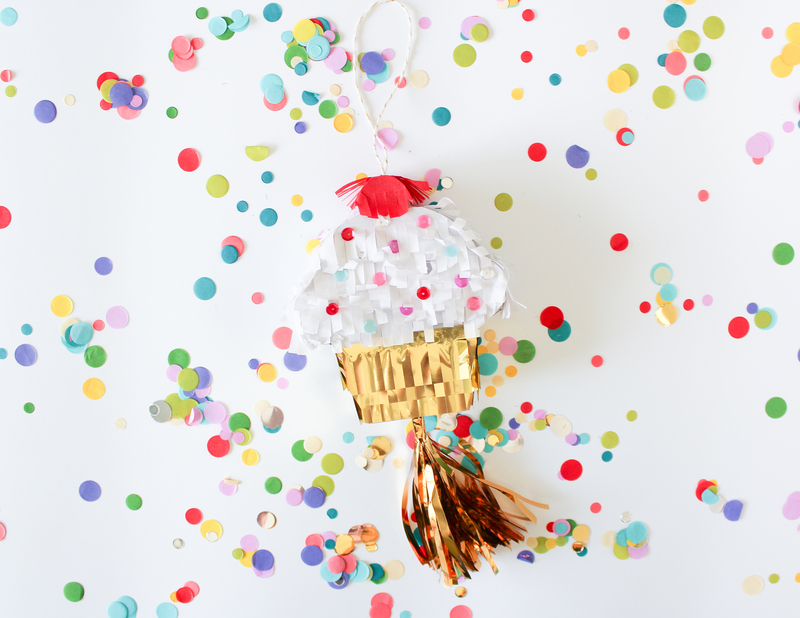 I’ve created a few different versions of the WRMK mini cupcake piñatas to share with you. I’m going to give you some tips on decorating them and share a few ideas I have for stuffing them full of fun! 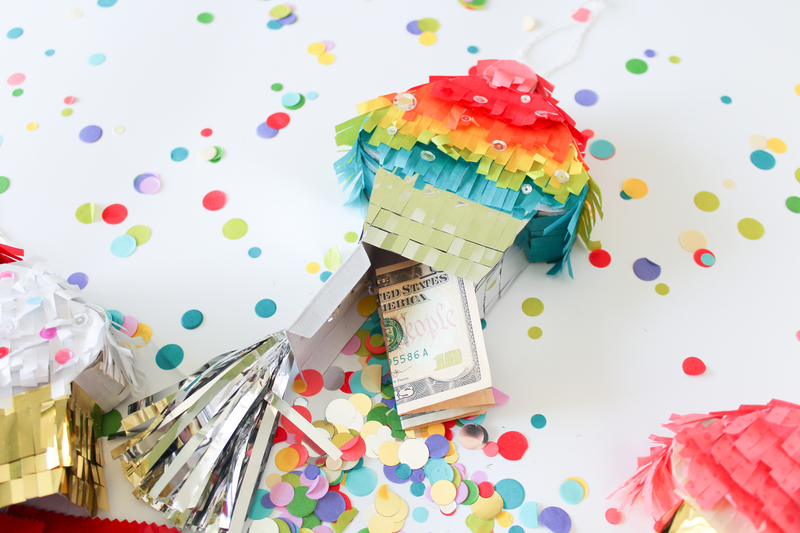 The WRMK fringe tape is a fast and easy way to decorate these mini piñatas. It’s not the only way, but I love the texture and color the fringe tape adds. Because the fringe tape has adhesive on the back, you can quickly apply it your piñatas. I love that this fringe tape is thin enough to tear too. This would be a fun project for your littles. It’s easy enough for their little hands and would allow them some creative time. It would be a great activity at your next party! The fringe tape is available in so many fun colors. For my first piñata, I just couldn’t resist using the entire rainbow of colors. I created some rainbow frosting on my cupcake. I also used the silver metallic fringe tape along the bottom. This reminded me of the aluminum cupcake liners my mom used to use. And it adds some fun shine to the cupcake! To add even more shine, I added a silver pull to the bottom. This allows the recipient to quickly open the piñata (without getting out their mini baseball bat). I sprinkled on some sparkling clear sequins as well. These make for a fun accent. And a cupcake isn’t a cupcake without some sprinkles. I was having such a fun time with the fringe tape, my imagination started running off on me. For my next cupcake, I was thinking of ways I could customize the fringe tape. I used a large rubber background stamp to stamp a pattern on the pink fringe. I chose a tone on tone effect for this cupcake. I think the pink polka dots are so much fun! I finished this cupcake off by adding a die cut heart and heat embossed sentiment. This would make a great little gift! The fringe tape is also available in white. You could create custom colors of fringe using inks, markers and mists. I experimented with several of these mediums and had great success. When using a mist, it’s important that you mist lightly. You will have a bit of curling, but I think it adds to the fun texture of the fringe. For my last cupcake, I decided to go with white frosting. Vanilla is my favorite. I used some fun colorful sequins to add a bit of sparkle and color to this cupcake. I also used some shimmer mist over the white fringe to make it sparkle. It’s hard to capture in the photos, but it really shines in real life. I’m sharing a video tutorial over on my blog, SprinkledWithGlitter.com. 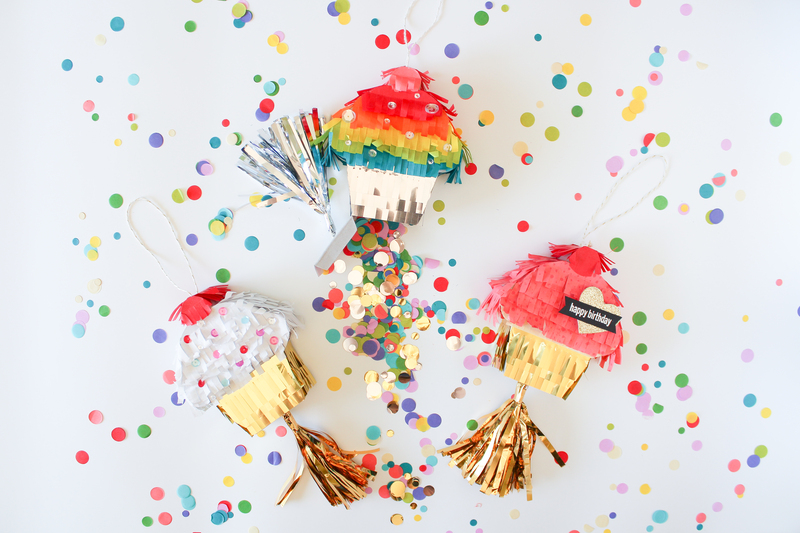 I’ll be sharing some tips for adding the fringe to these adorable mini piñatas. I found it easiest to apply the fringe to the front and back of the piñata first. 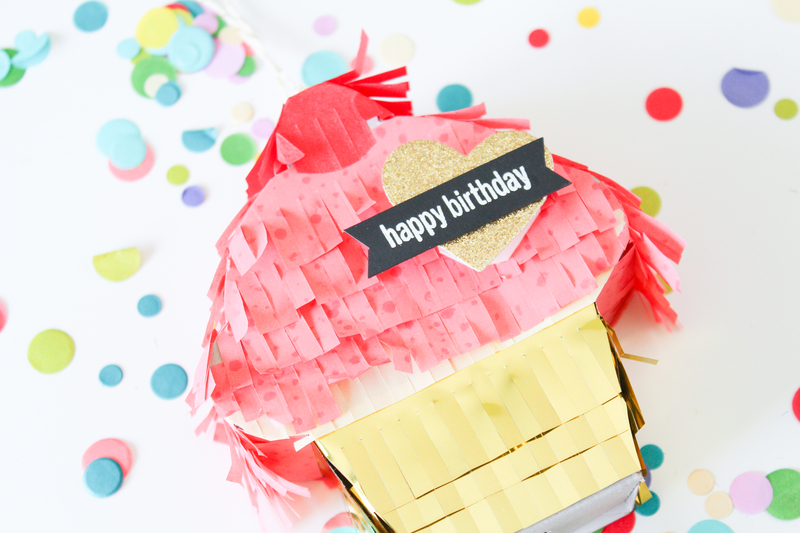 Instead of trying to rip or cut the fringe in the shape of the piñata, which can be a little awkward, wrap the fringe around the side and tear it. After you’ve applied the fringe to the front and back, add the fringe to the sides of the piñata. This will cover those bits of fringe you’ve wrapped around the edge and give your piñata a finished look. Always, and I do mean always, work from the bottom up. It’s nearly impossible to tuck the fringe up under other layers of fringe that you’ve already applied. 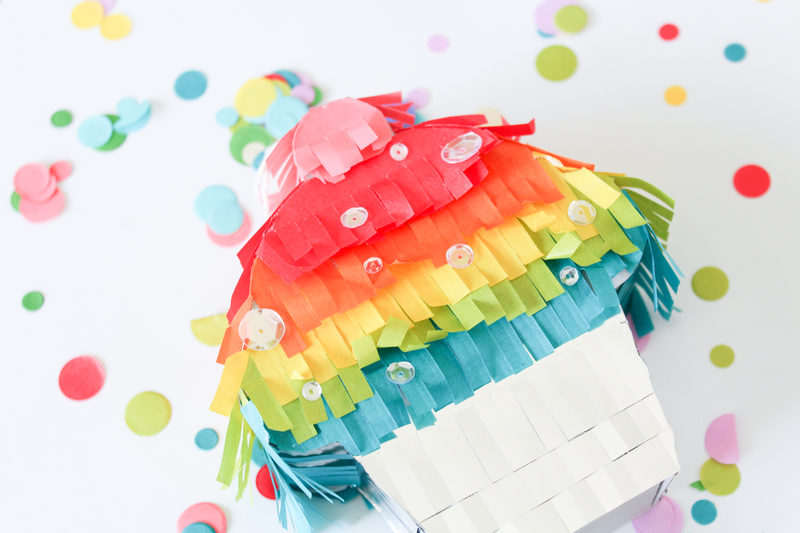 Precut fringe to add to the sides of your piñata. I found that the sides were about 1 ½ inches. I precut several pieces to apply to the sides, making the application go much more quickly. You could also decorate these piñatas in other ways. You could paint them. You could decopage them with decorative papers. You could ink them. The sky’s the limit! Since their made of a thin chipboard material, they’re very easy to work with! I couldn’t resist thinking of all of the fun things you could stuff inside of these piñatas. 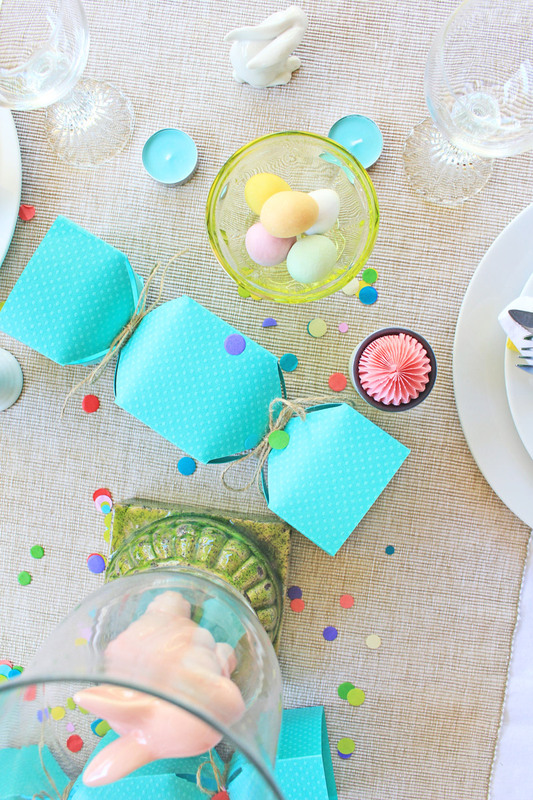 While they make fun decorations and favors for a party, they’re also a creative way to give fun little gifts. I’m sure there are a million and one things you can stuff inside, but here’s my top 10. Money –I mean, who doesn’t love cold hard cash? Gift cards – They fit perfectly inside. 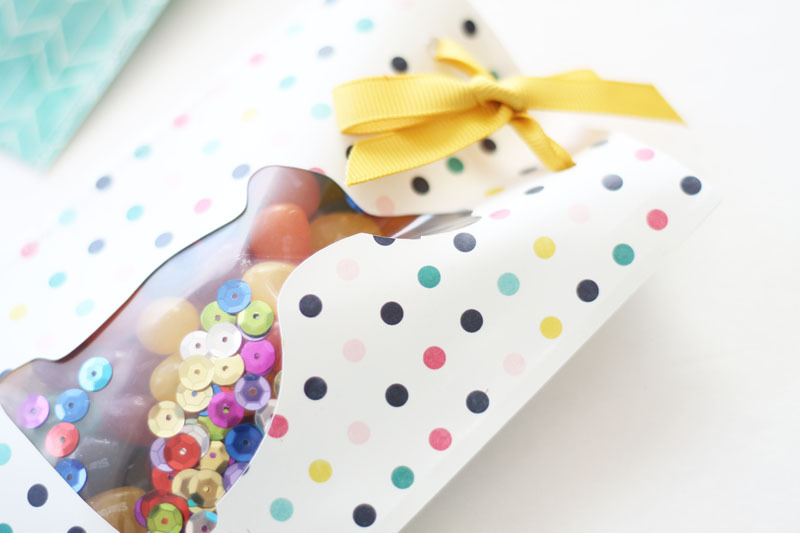 Confetti – There’s some fun colorful and metallic confetti available for these. What a fun surprise when the recipient opens it! 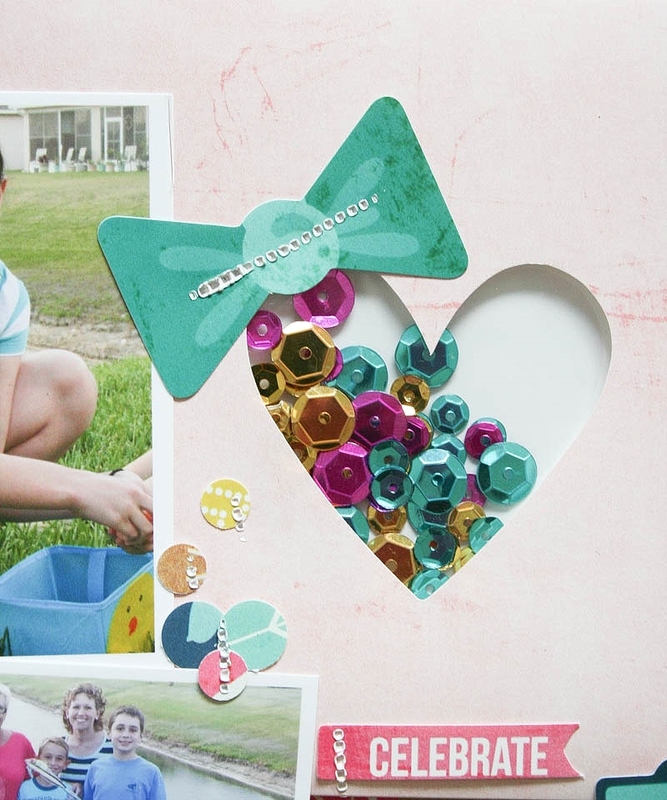 You could also punch some fun little shapes to mix in with your confetti, like hearts or stars. Sequins – It’s like the sparkliest confetti you’ll ever see. And you know I love my sparkle! Jewelry – This is a fun and creative way to give a tiny gift like jewelry. It’s a perfect fit! Mini nail polish – I know you’ve seen them! 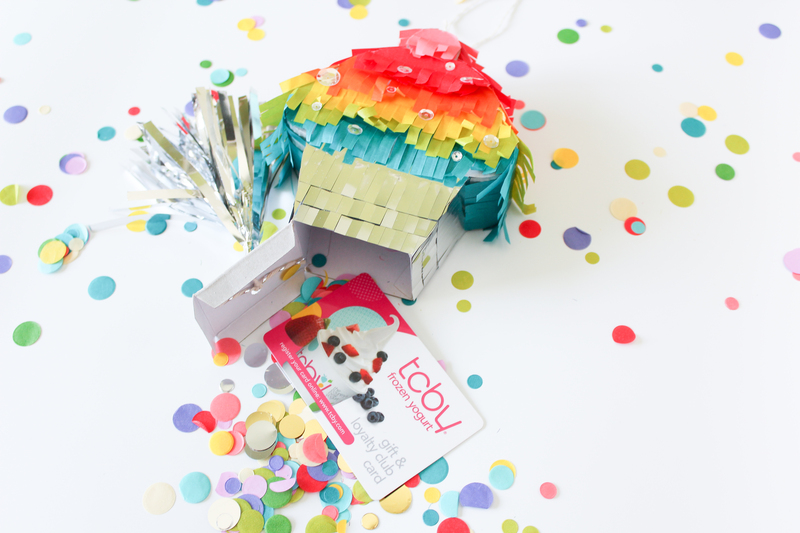 Those adorable tiny nail polishes would be a great little piñata stuffer for your next preteens party favors. Page flags, mini erasers, stickers, decorative paper clips and baby pens – For the planner lover in your life. 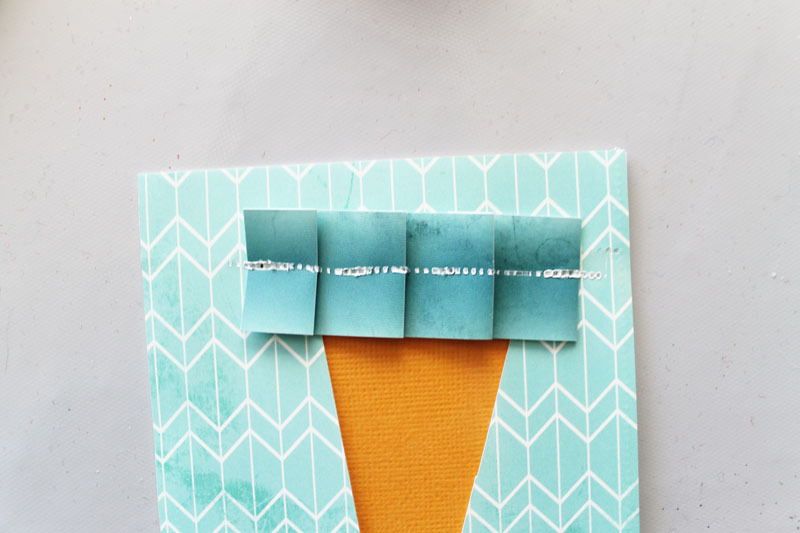 A heartfelt note – This would make the cutest envelope ever! 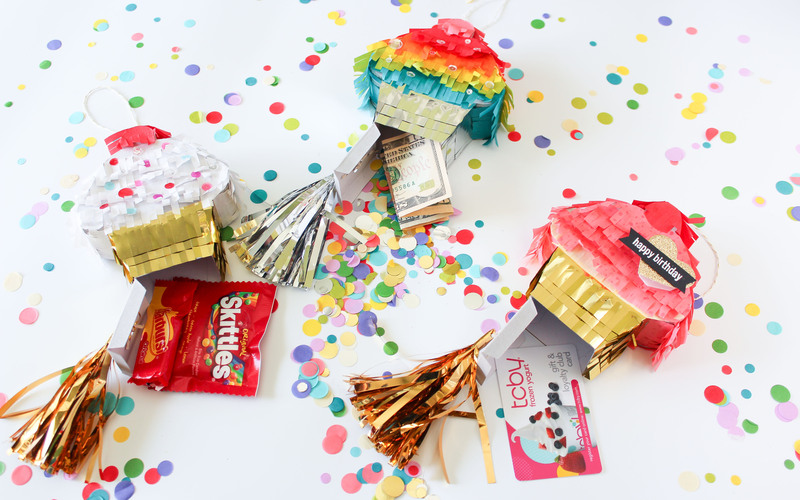 No matter what you fill these with, these mini piñatas are sure to be a hit! Thanks for stopping by today! 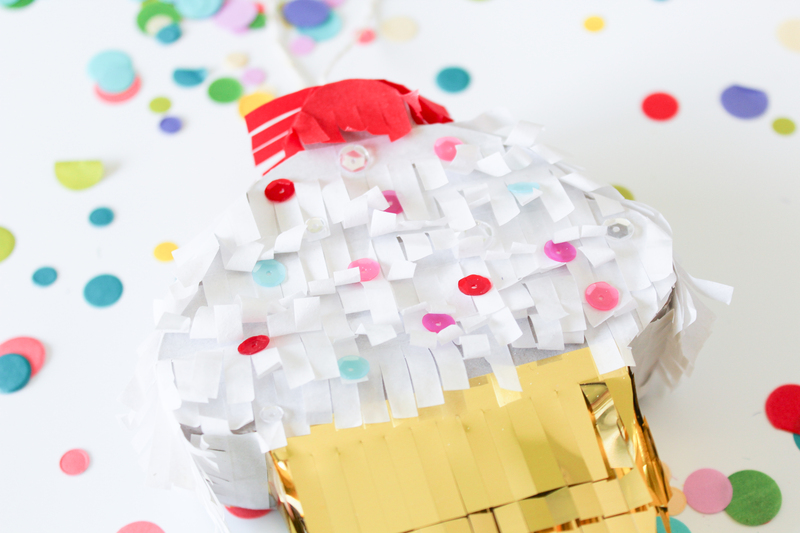 I hope you’ve enjoyed seeing different ways to decorate and use your mini piñatas! And I hope you’ll give it a try for your next party! Have a fabulous day!